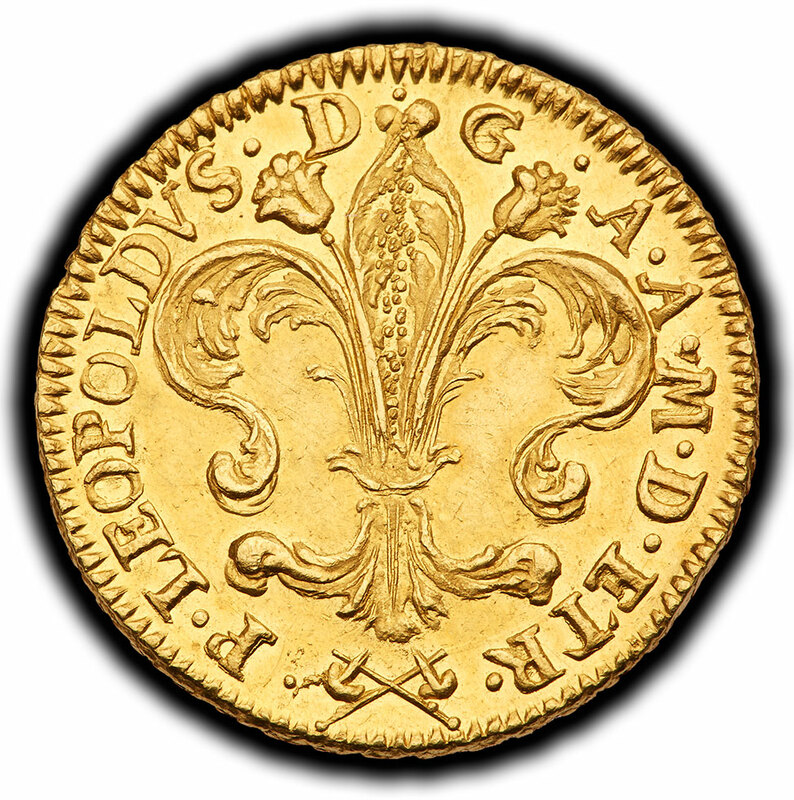 The Arno River divides and flows just to the south of most of Florence, which was the city of Michelangelo and the center of the Italian renaissance. 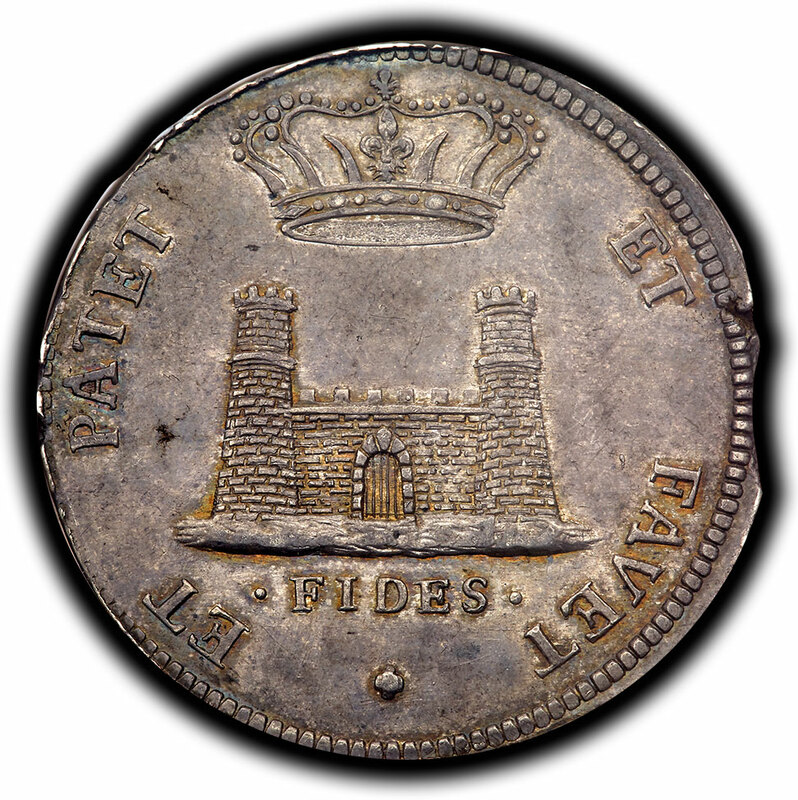 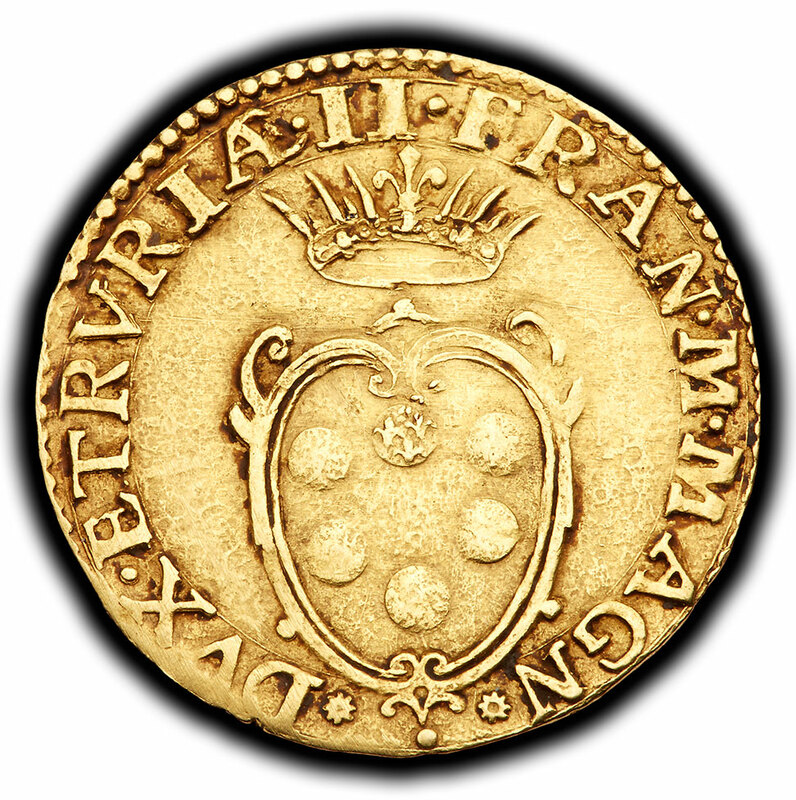 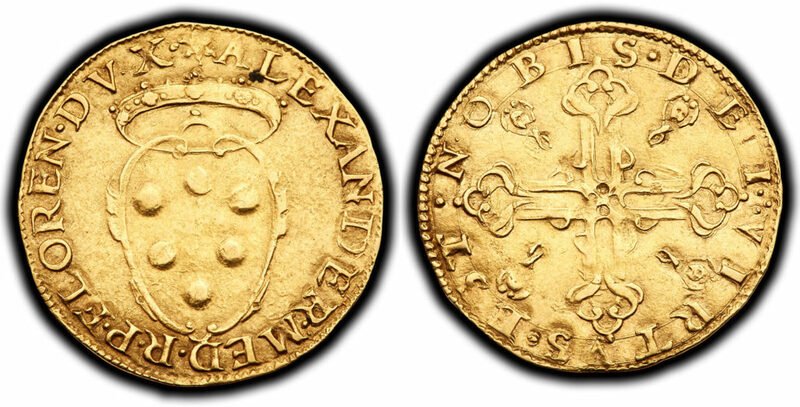 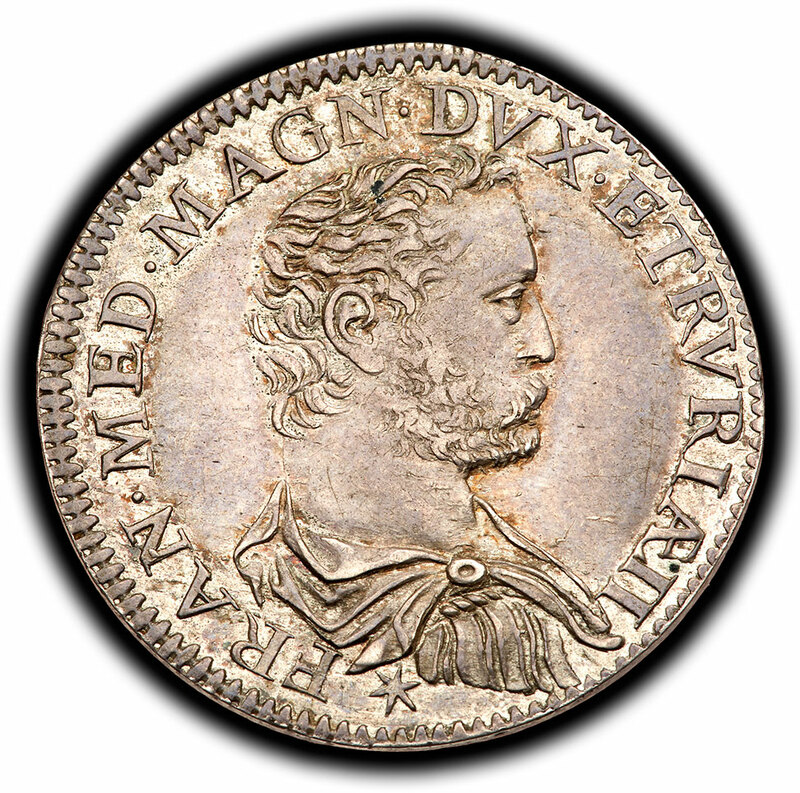 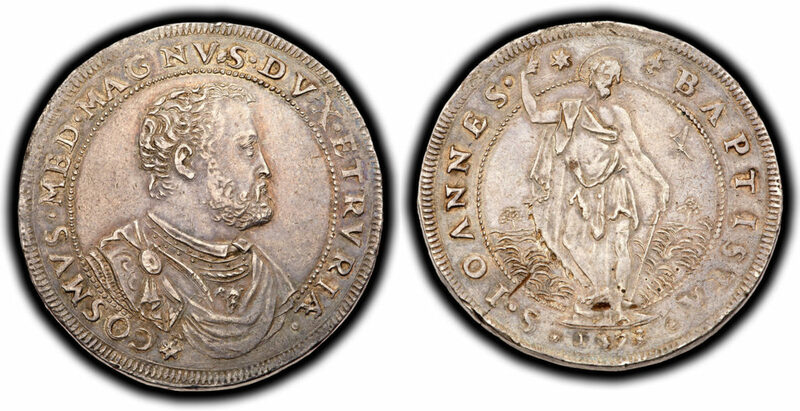 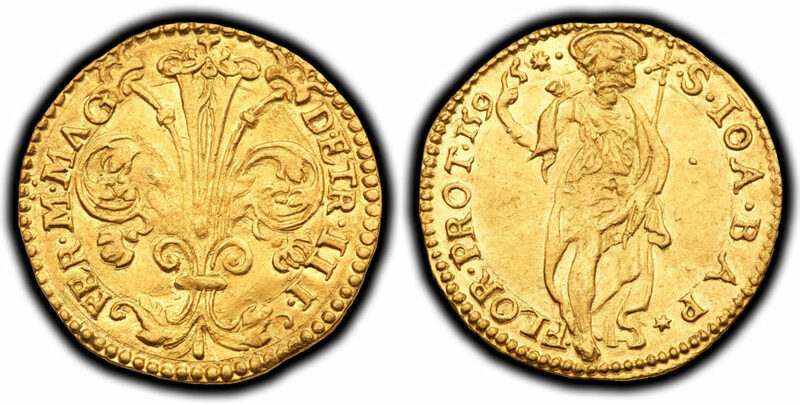 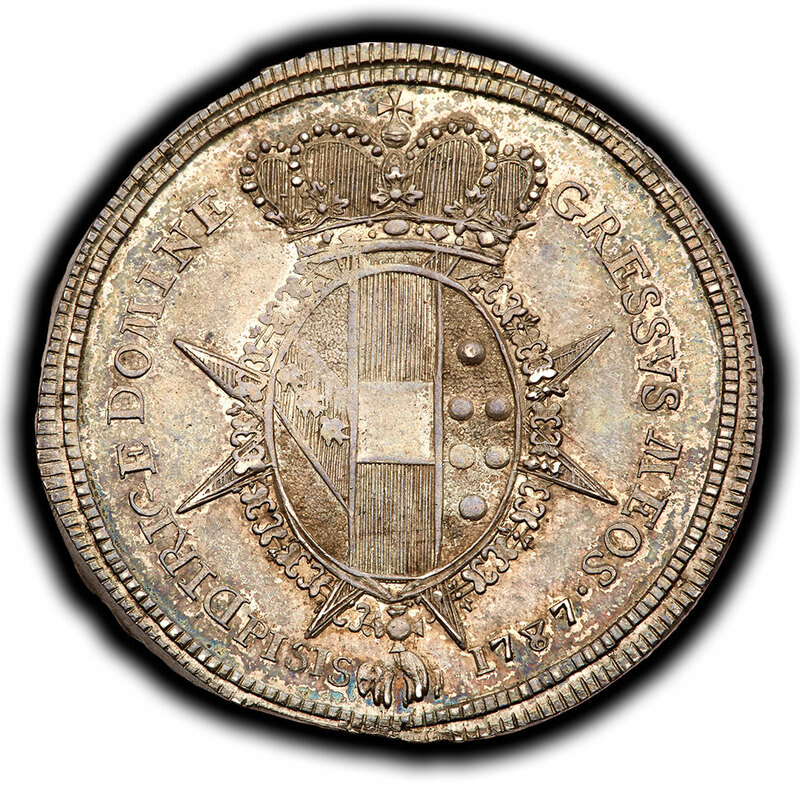 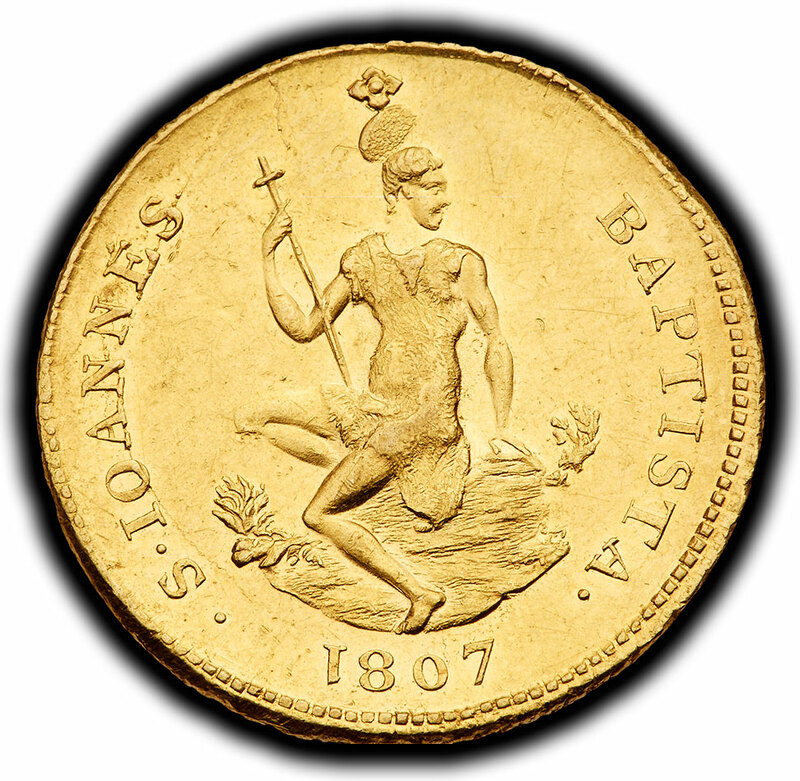 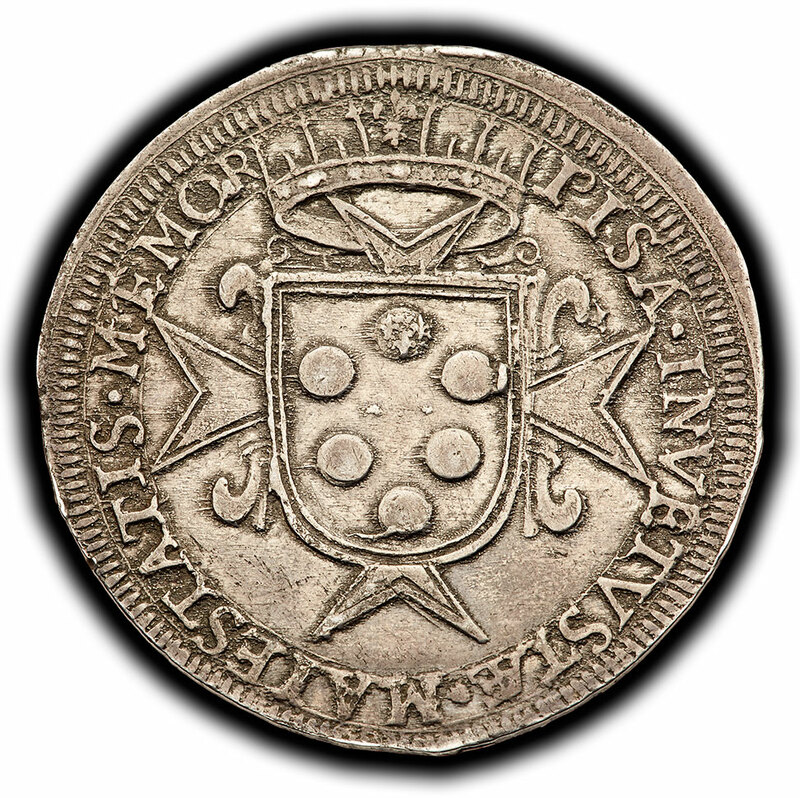 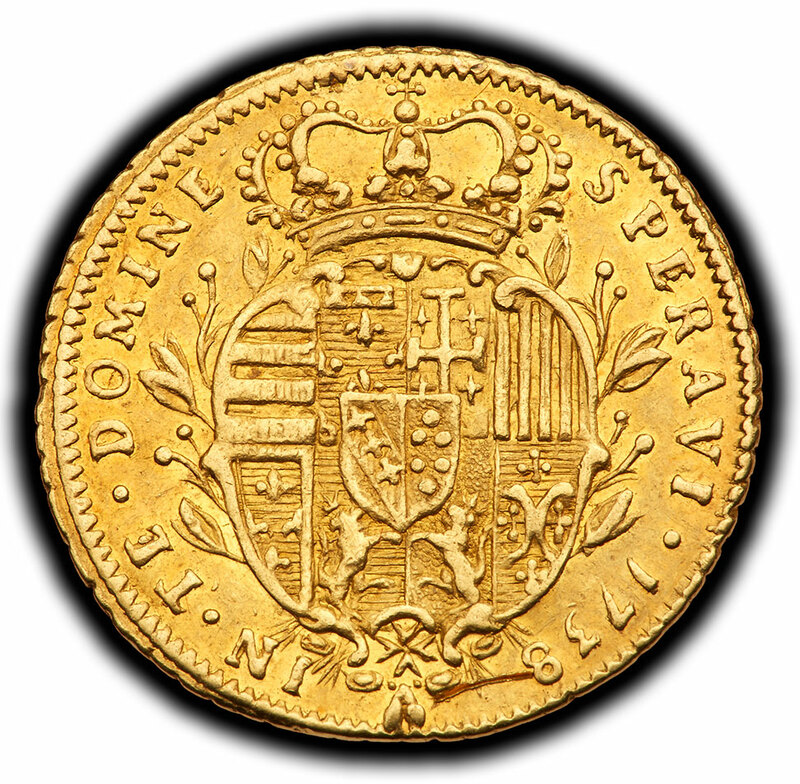 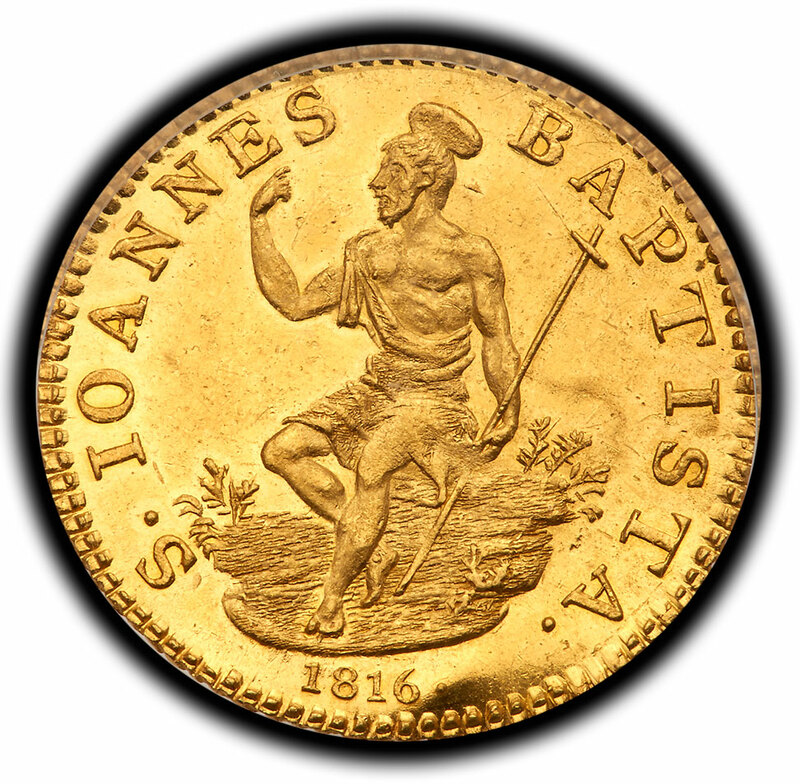 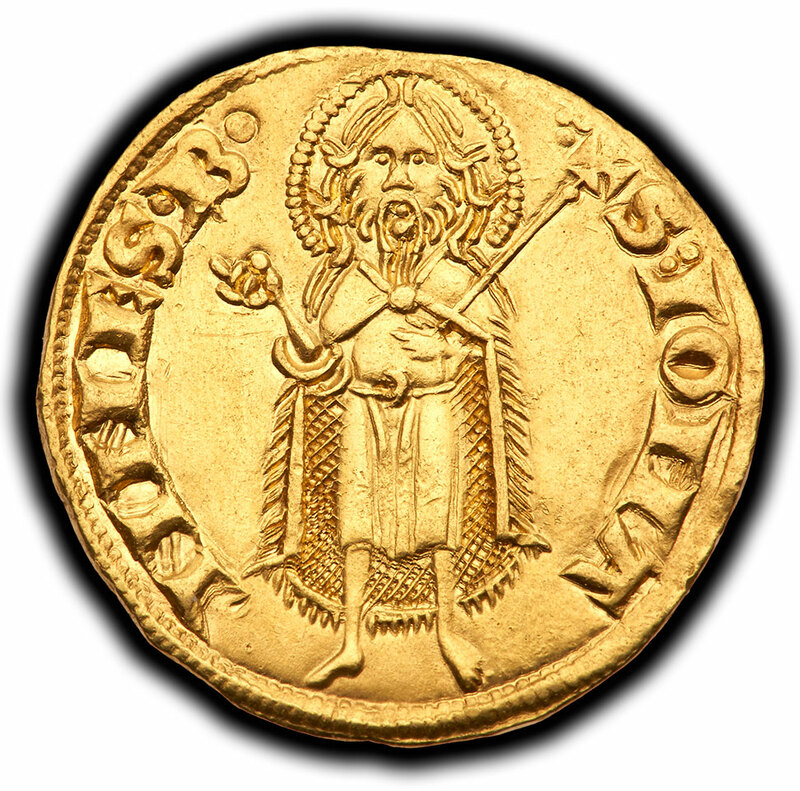 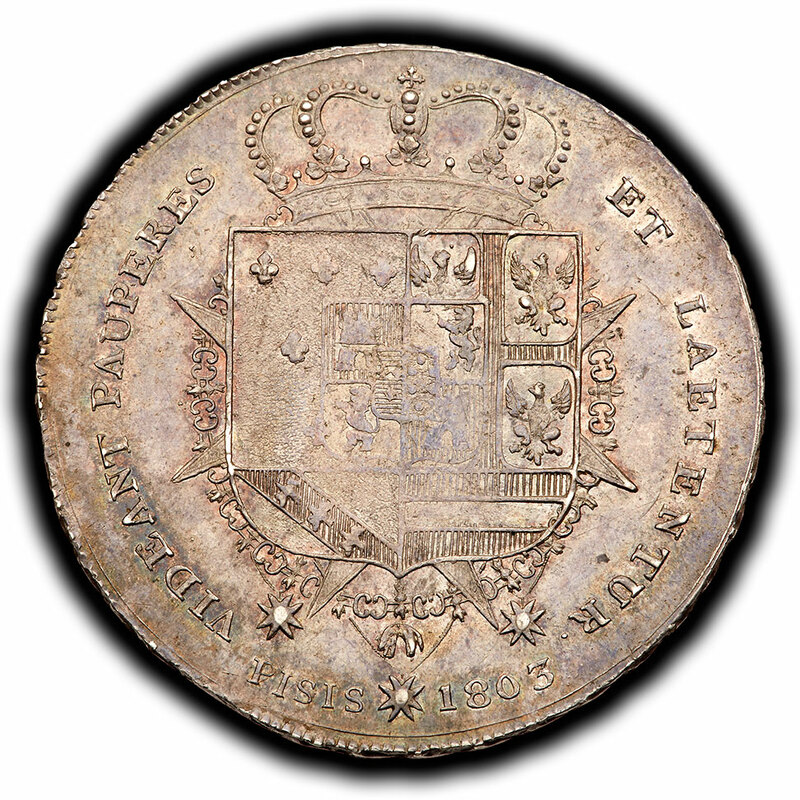 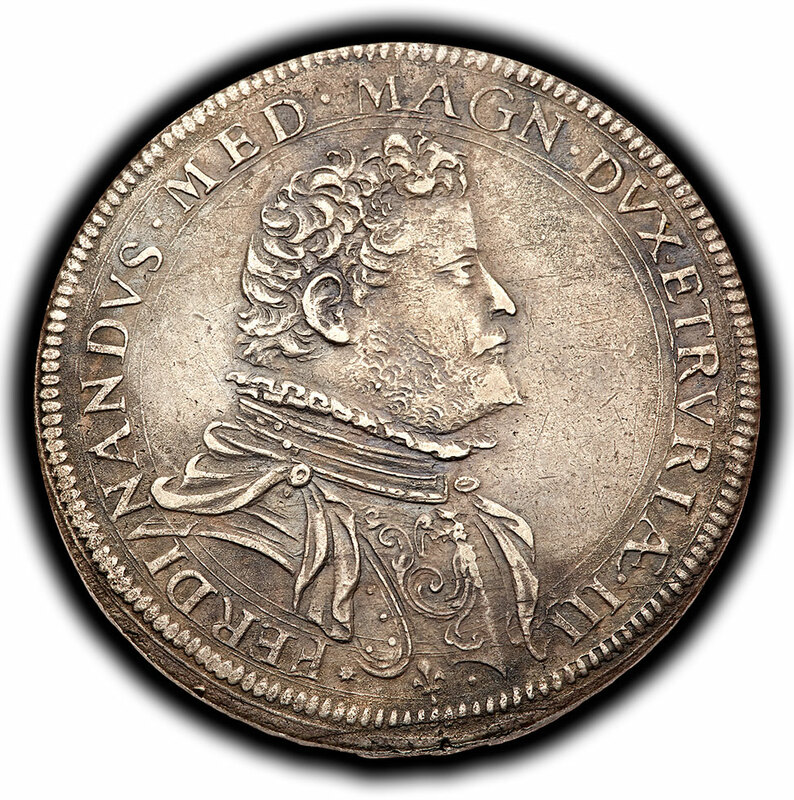 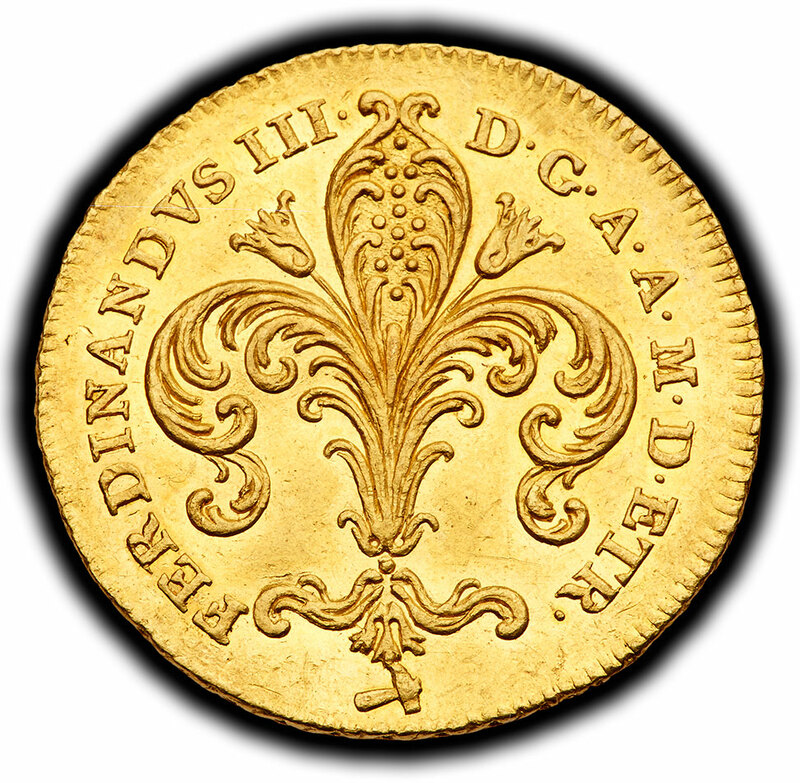 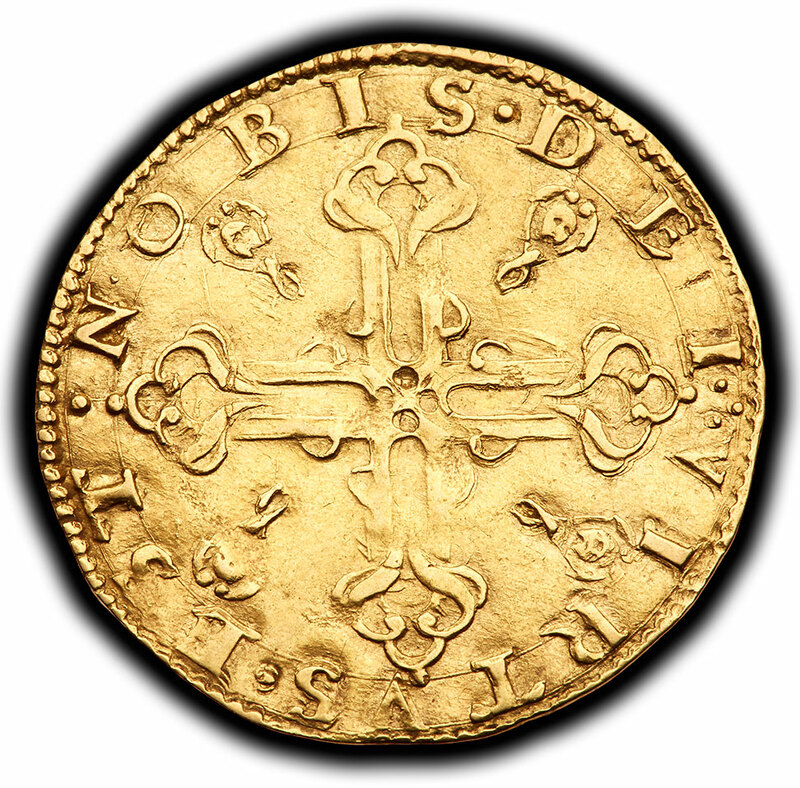 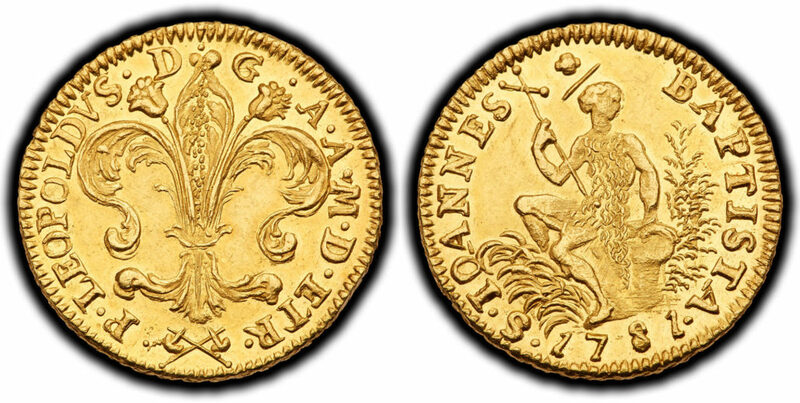 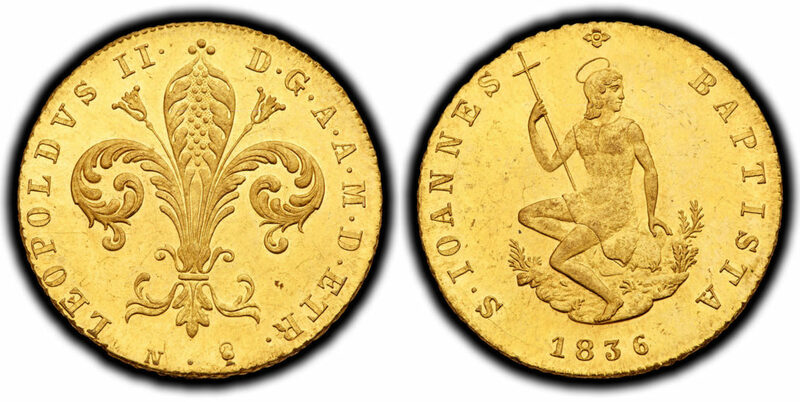 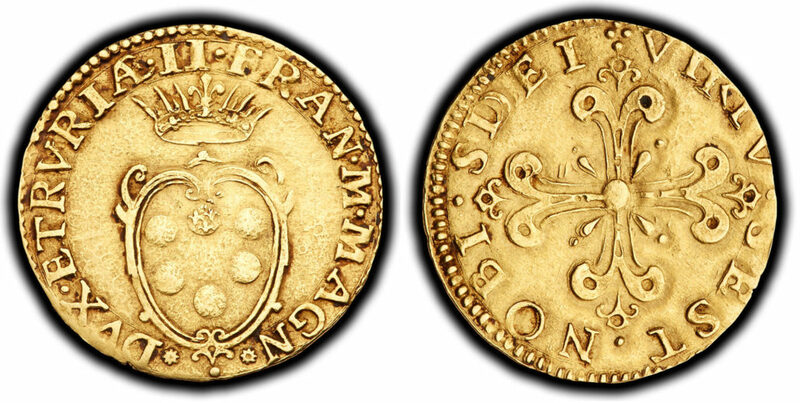 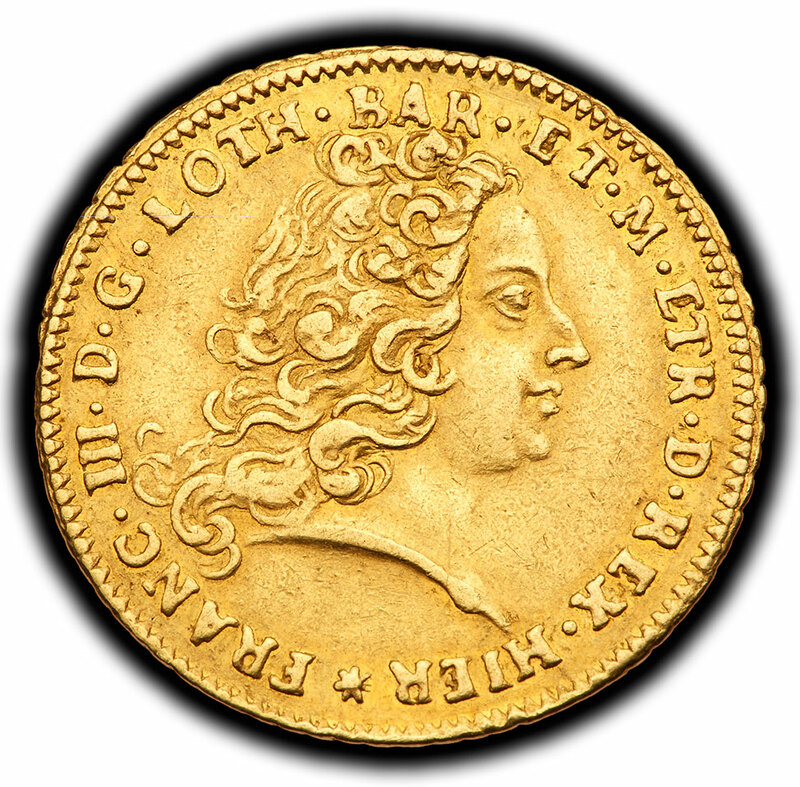 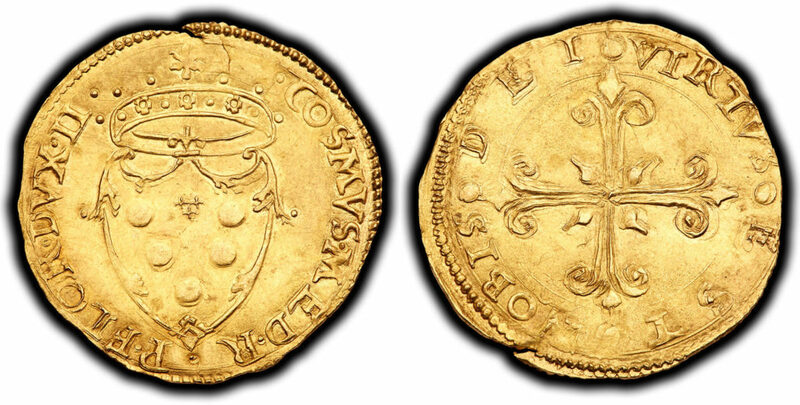 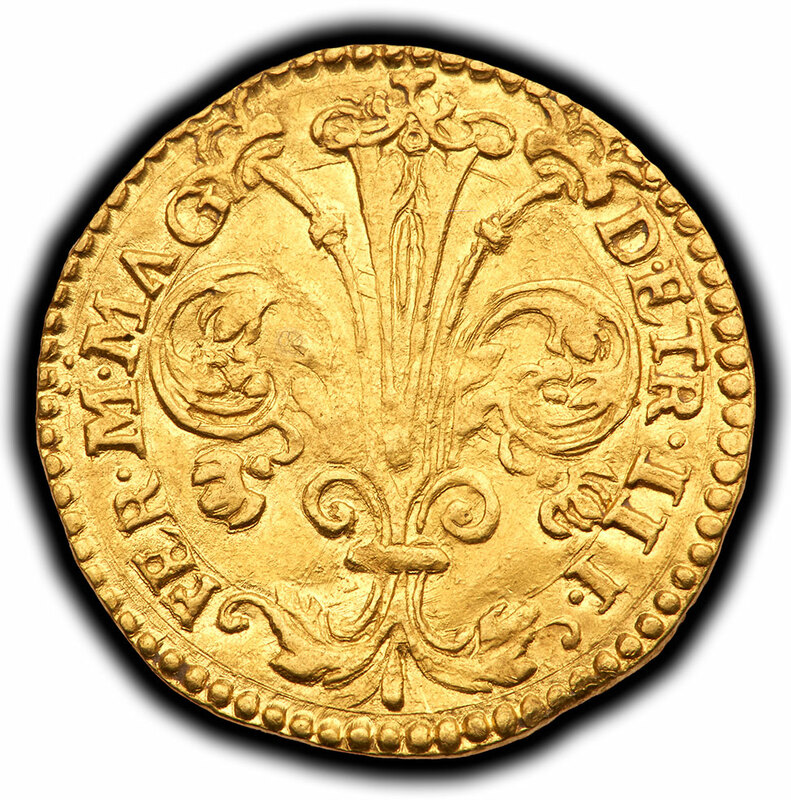 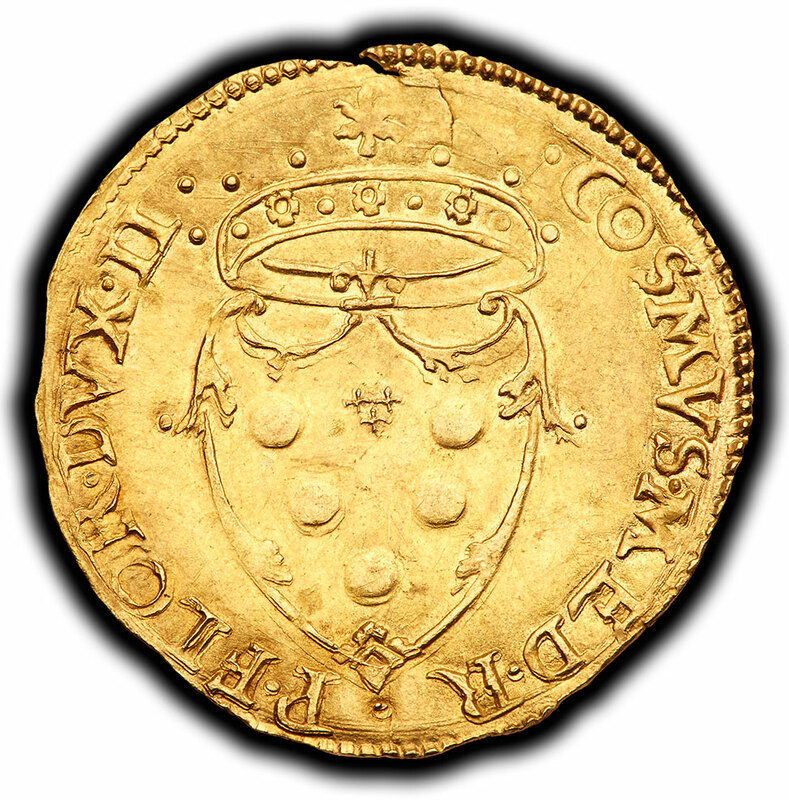 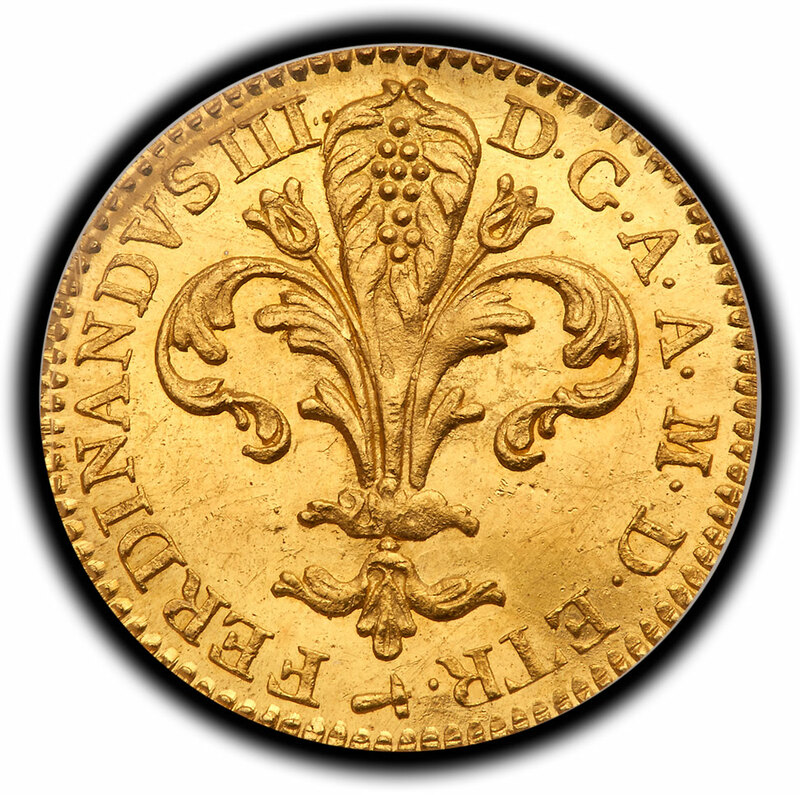 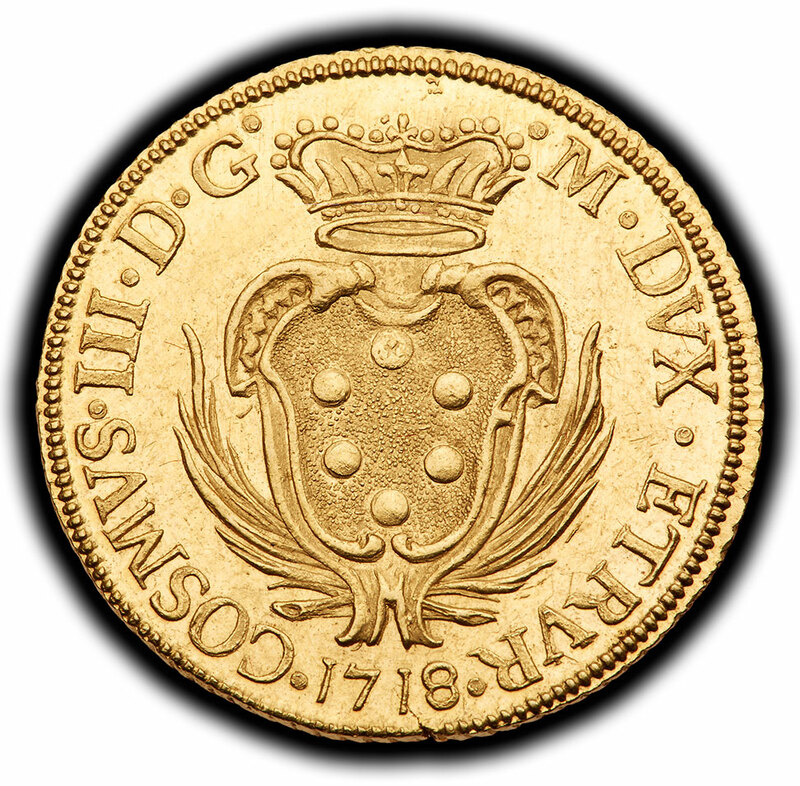 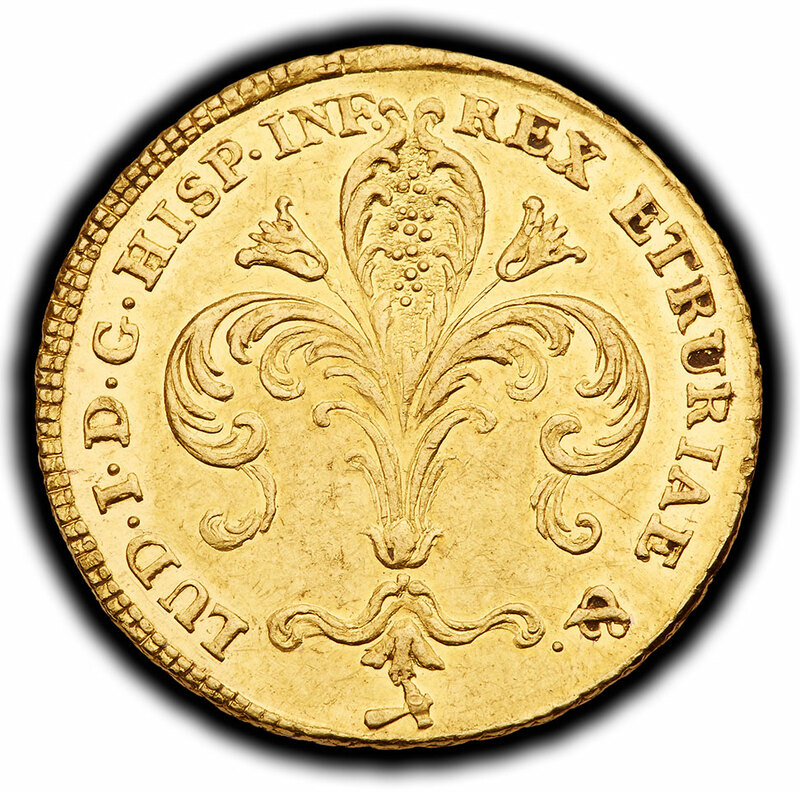 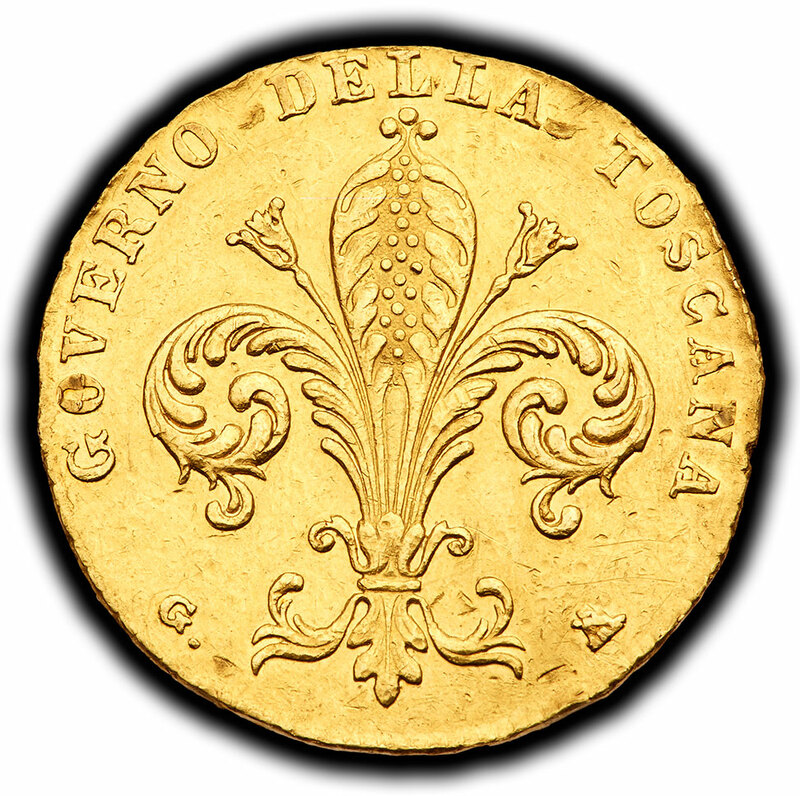 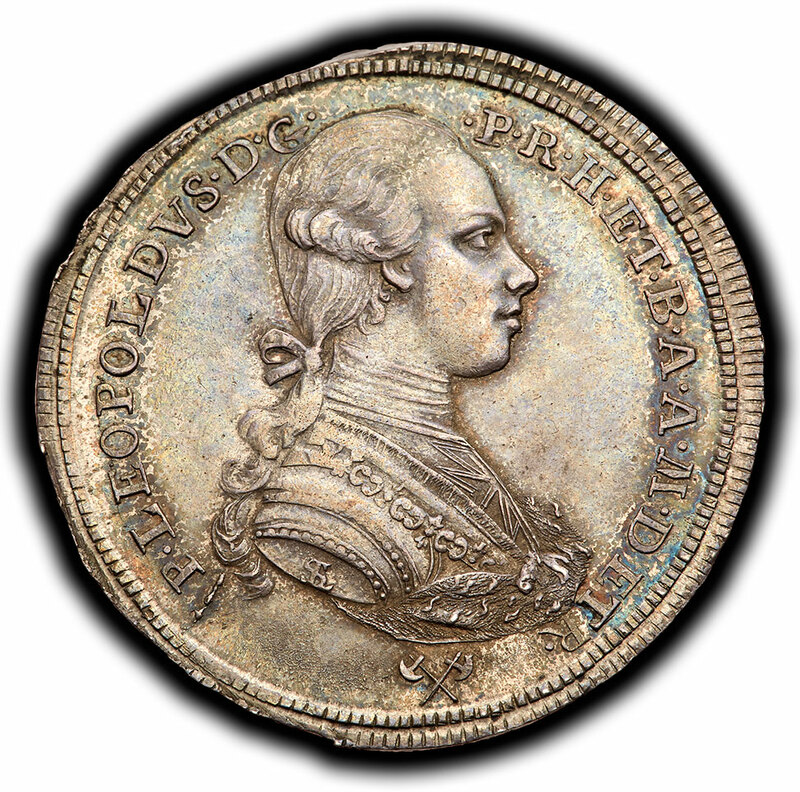 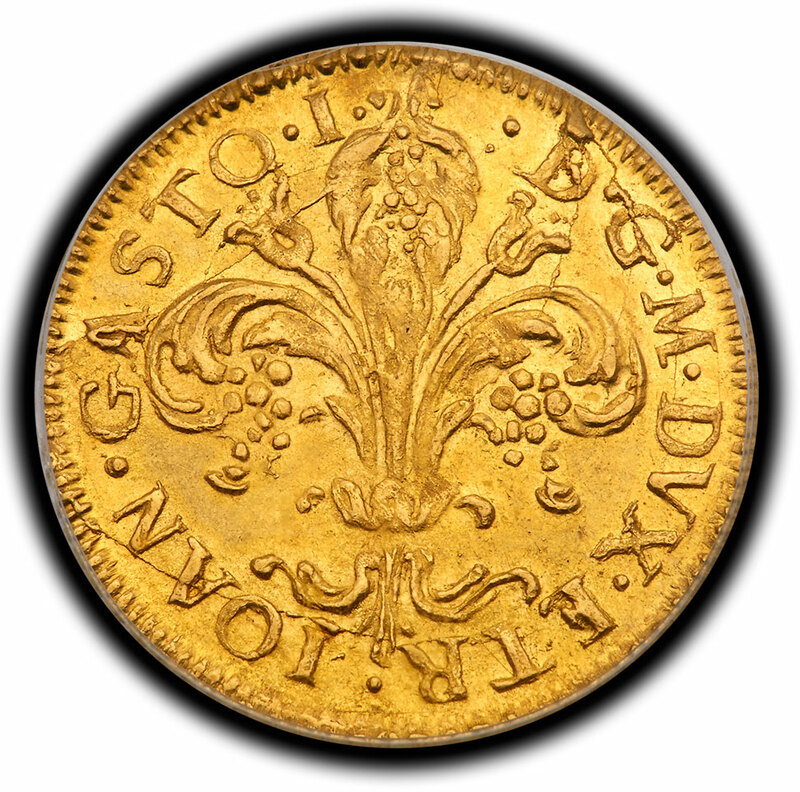 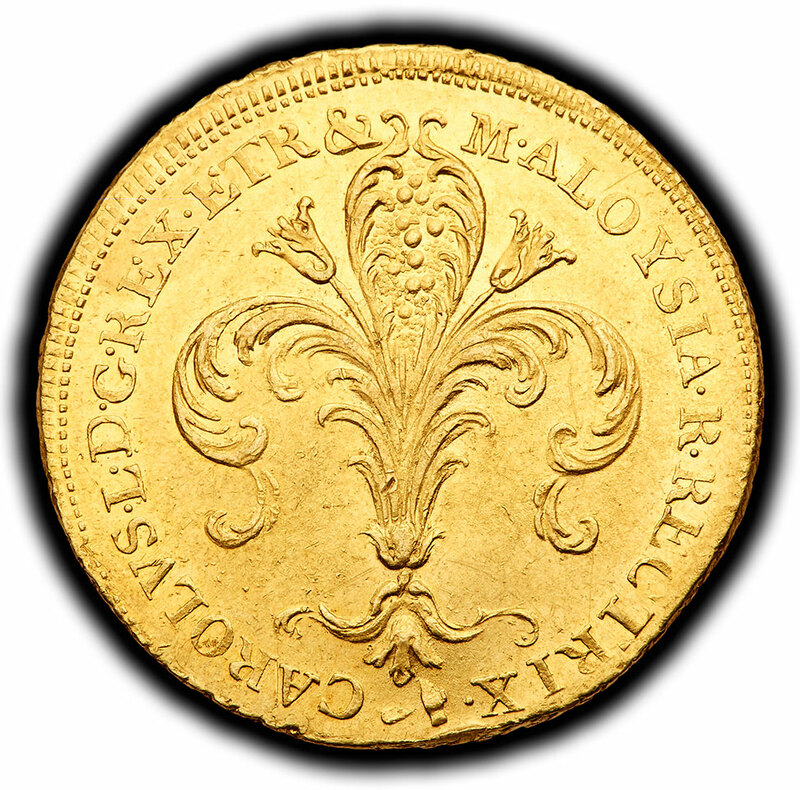 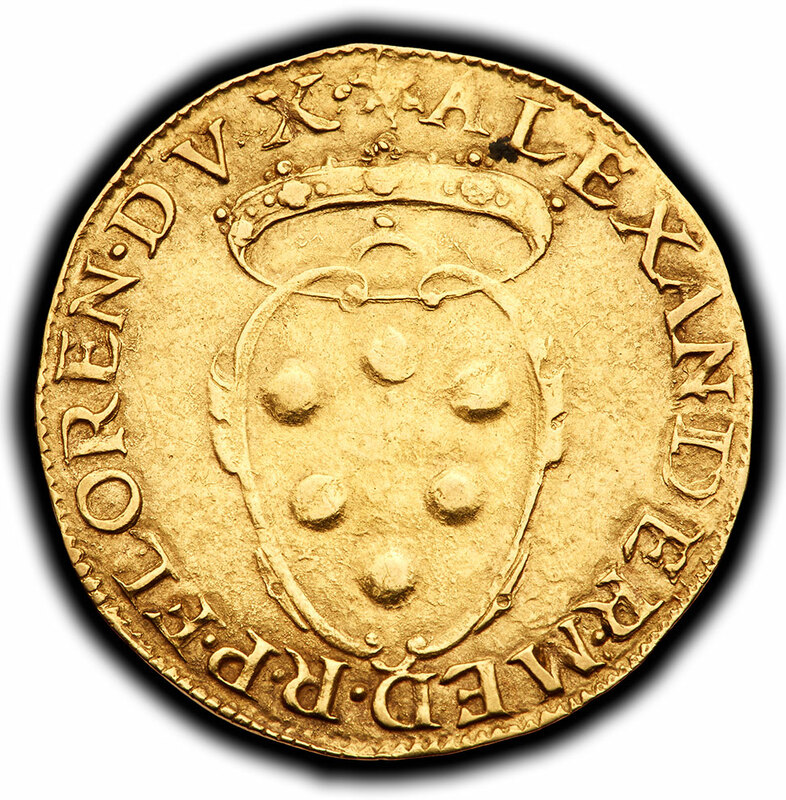 Its coinage history is much shorter than that of the other regions but features some of the most magnificent pieces, stretching from beautiful gold masterpieces of the grand dukes of the 13th century to an assortment of variously named money of foreign kings who finally surrendered their territory when Italy unified in the 19th century. 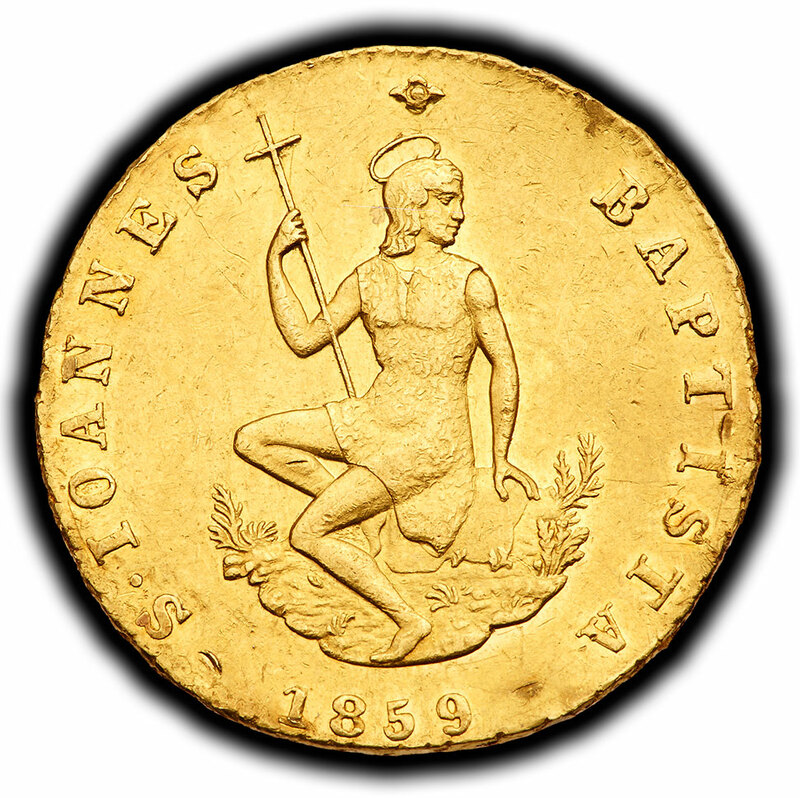 Many of the earlier coins feature highly religious images. 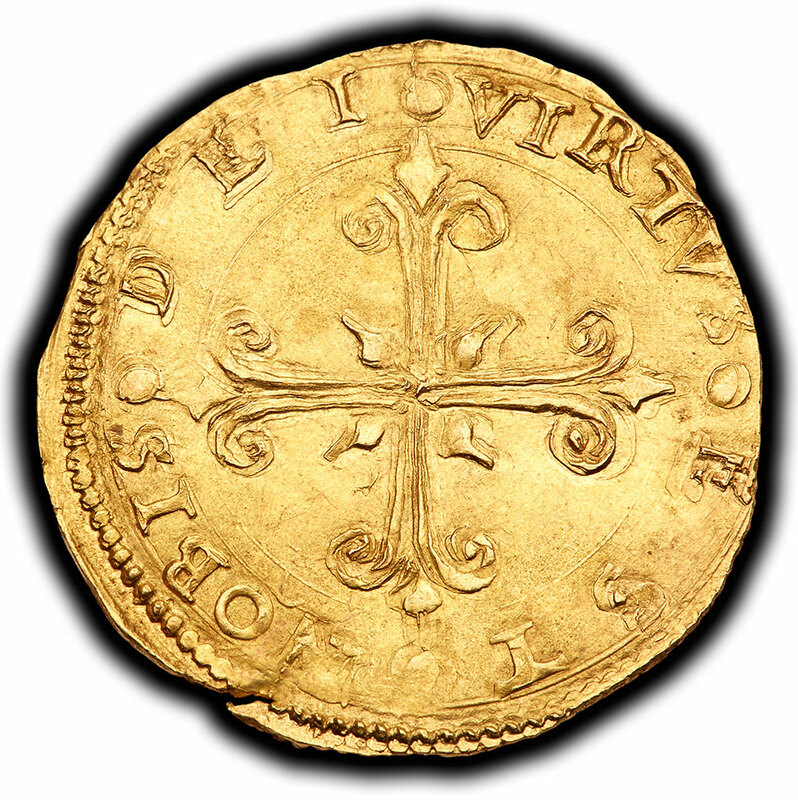 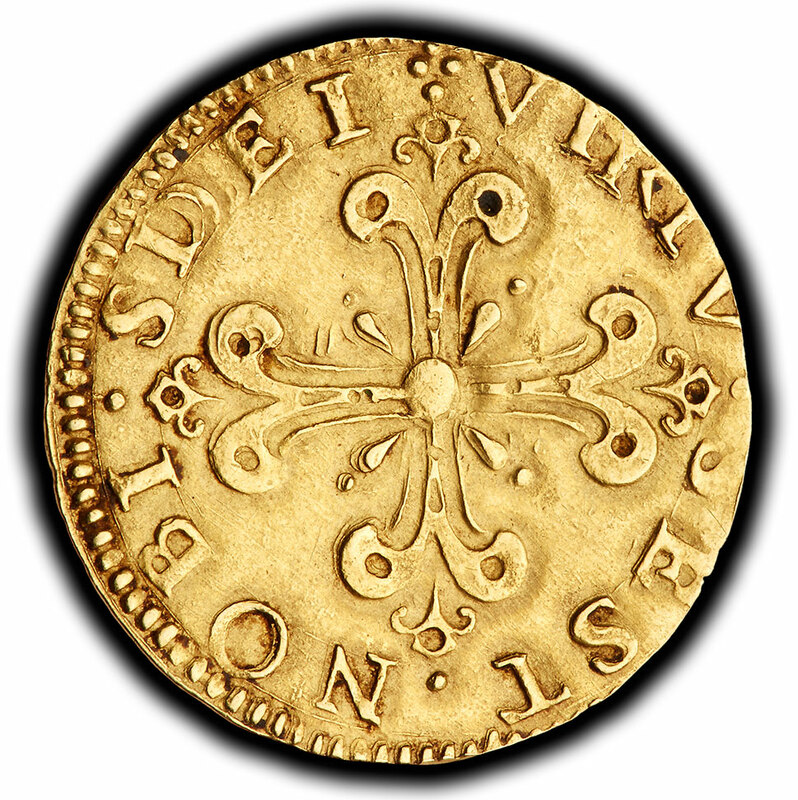 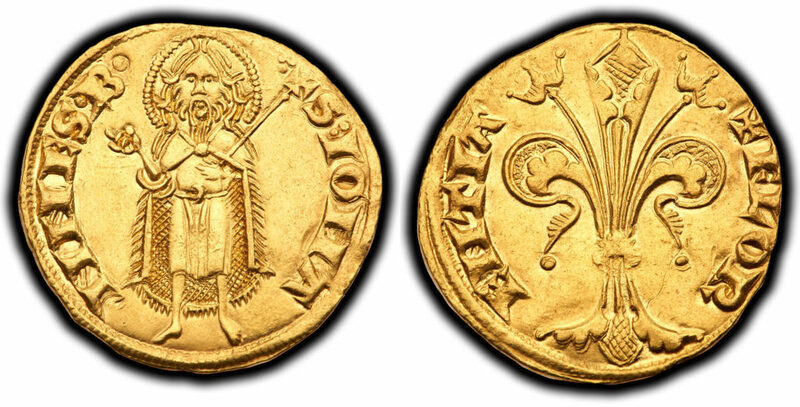 Well centered, a choice example of this rare, early gold florin. 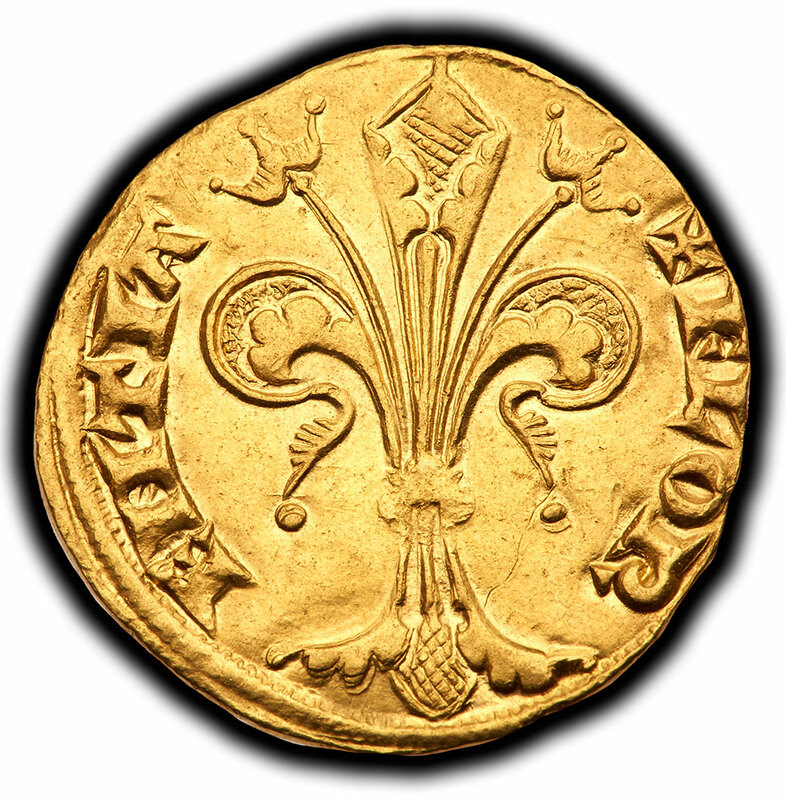 Bold, early images of St. John and the symbolic lily of Florence as a republic. 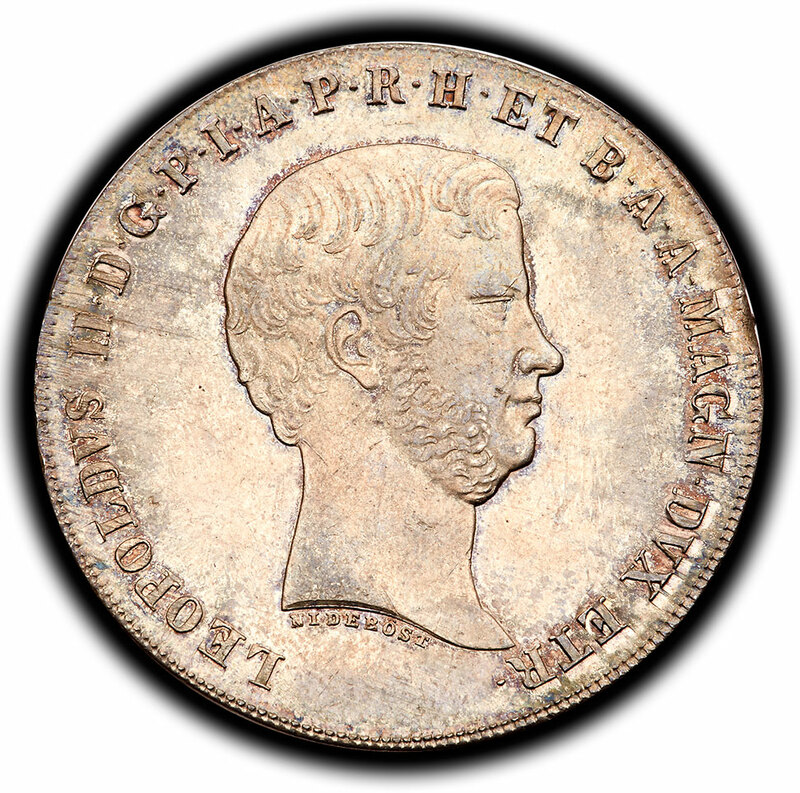 Obverse depicts bust of duke right. 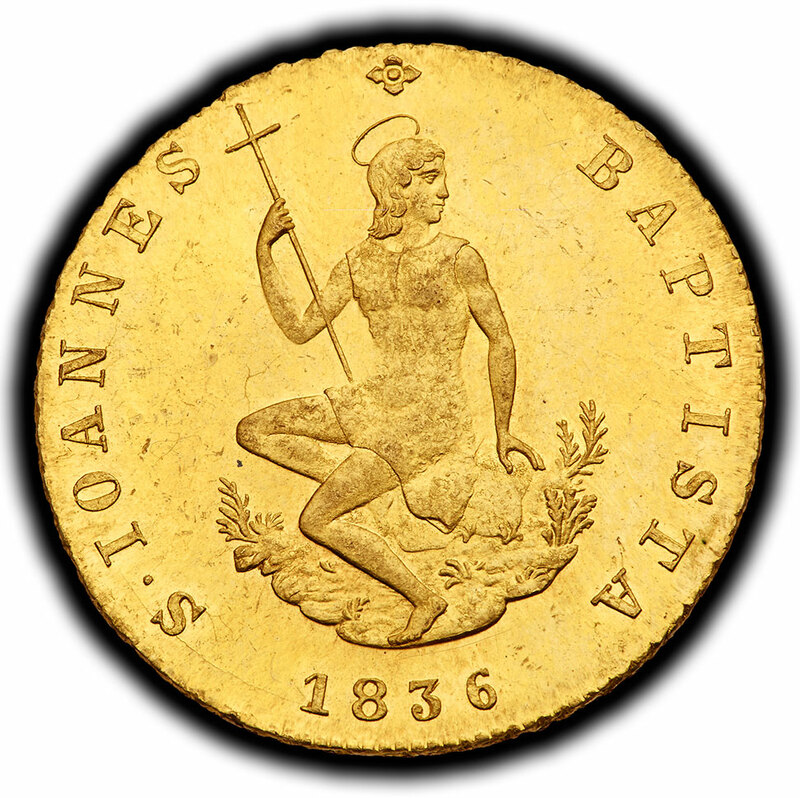 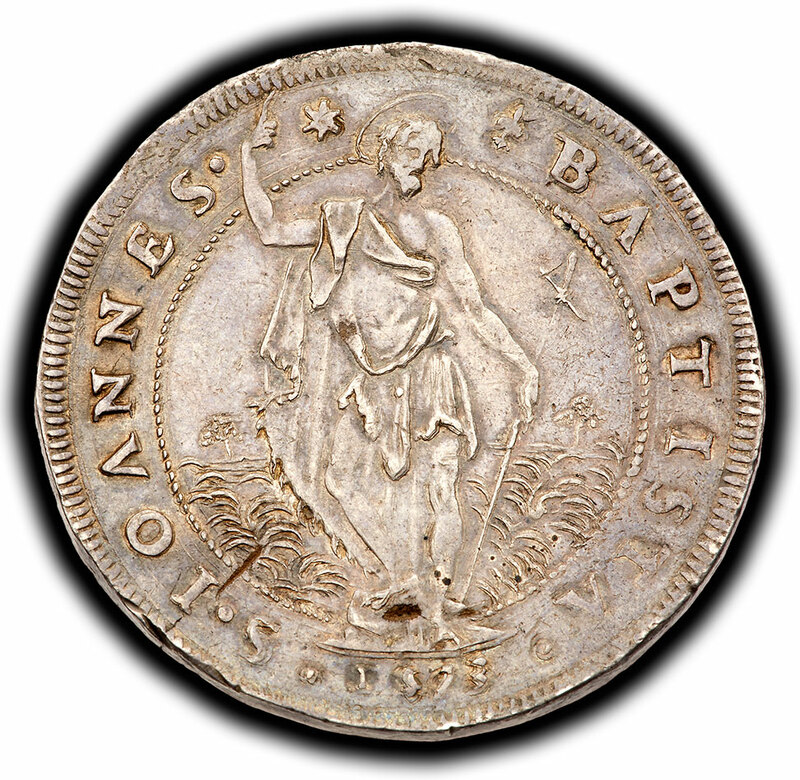 On the reverse has St. John baptizing Jesus. 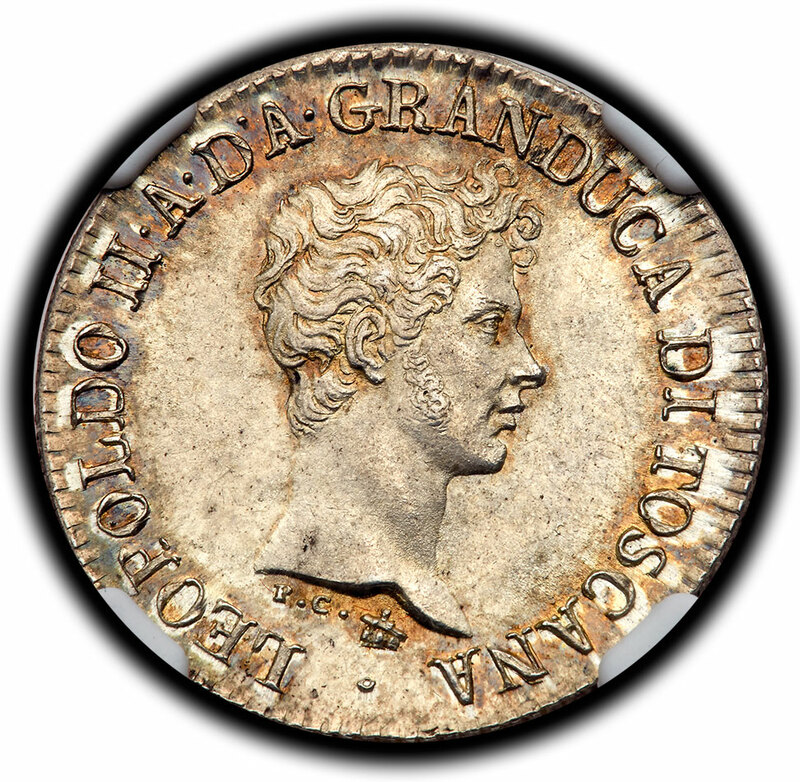 Granular surfaces but well centered with an imposing portrait and pleasing old patina. 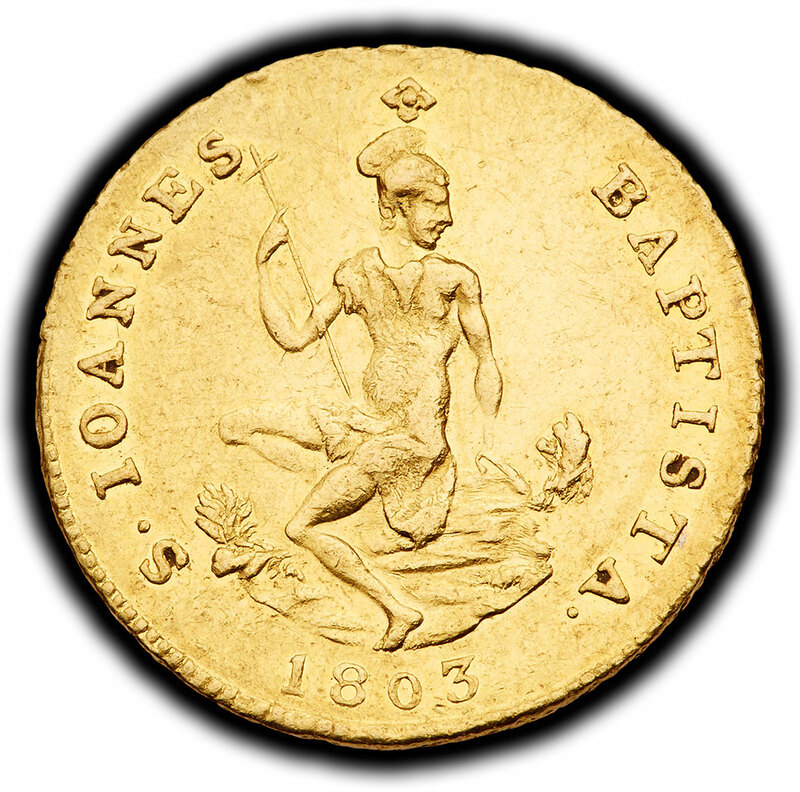 John the Baptist image wearing halo, lovely gold toning and sharp details. 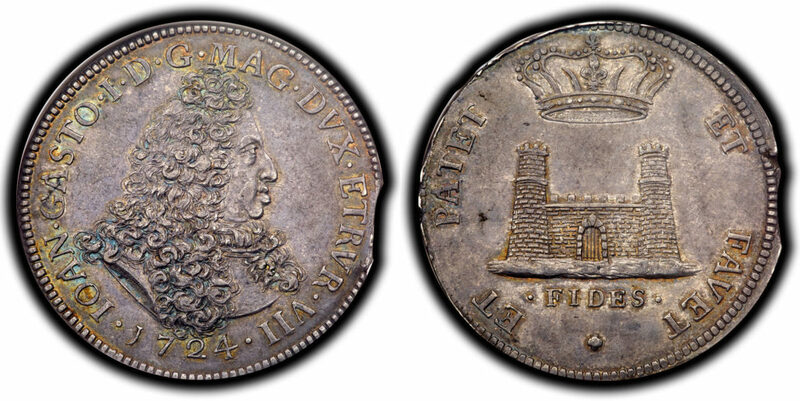 Wonderful portrait and castle wall, lovely antique patina, small edge clip as made. 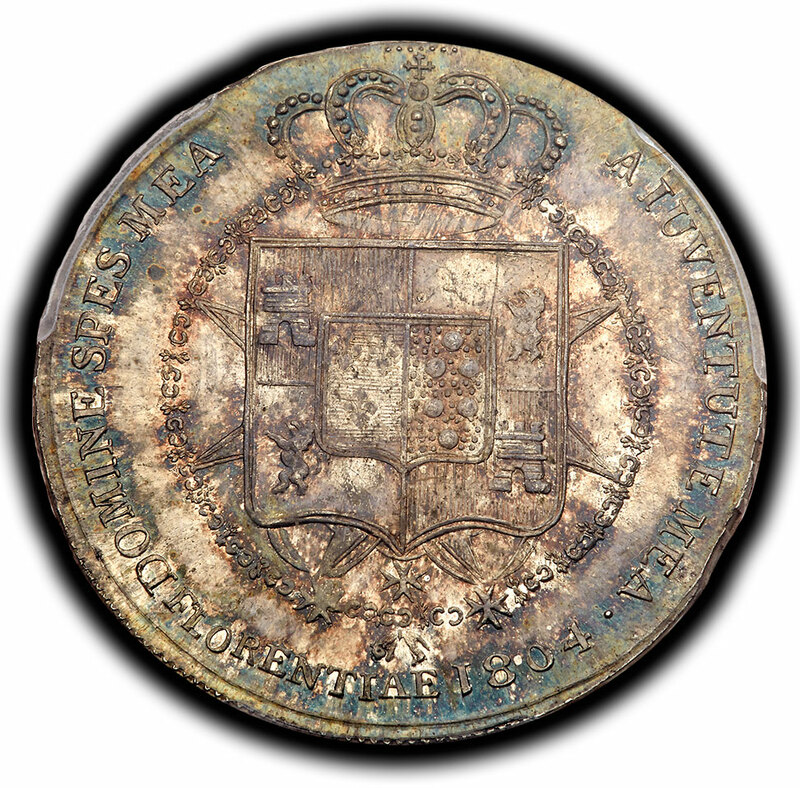 Evenly detailed, pleasing surfaces other than small ancient scratch on reverse. 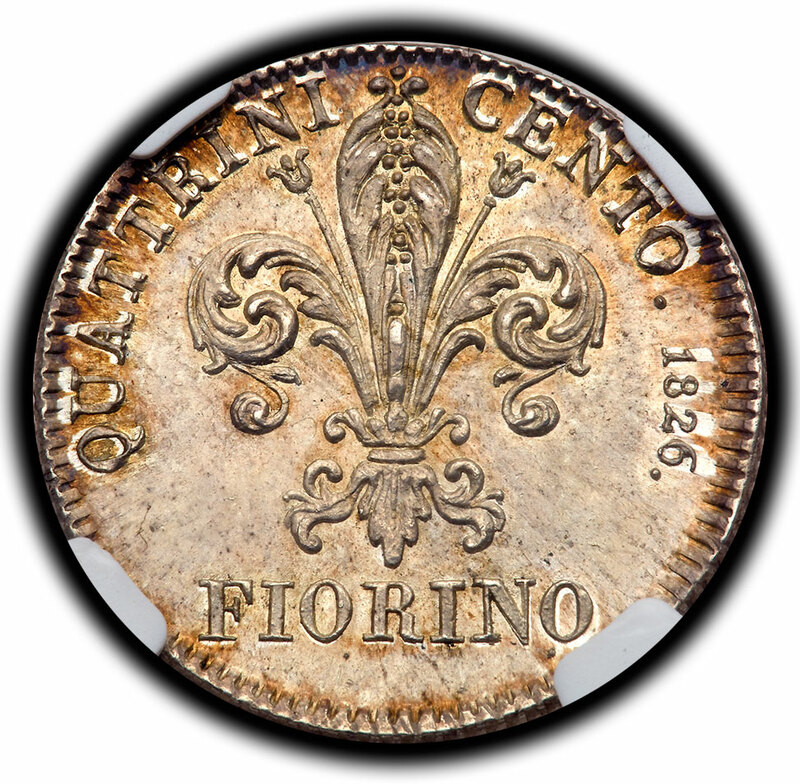 During Francesco’s reign, although he was a careful administrator, the duchy was bankrupted by the Wars of the Spanish, Polish and Austrian Successions, forcing him to sell many fine paintings in the Estense Gallery. 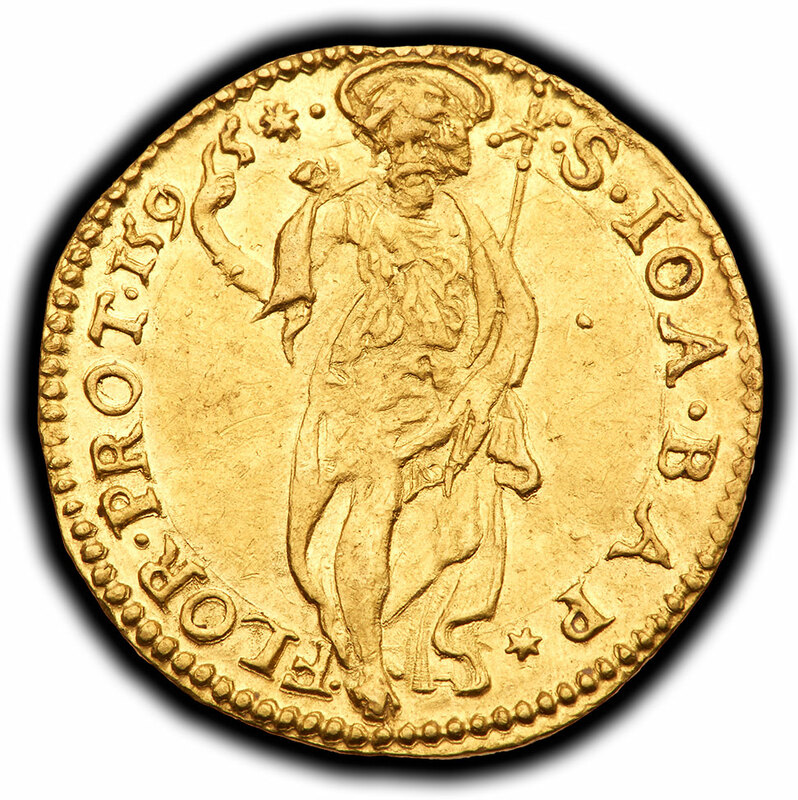 Very few gold coins struck in his name have survived. 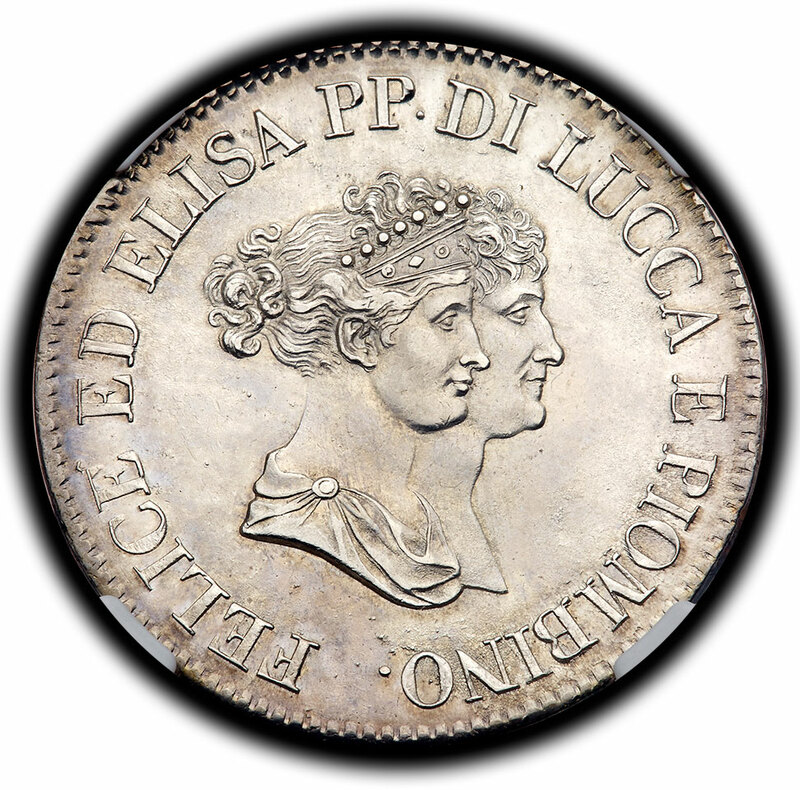 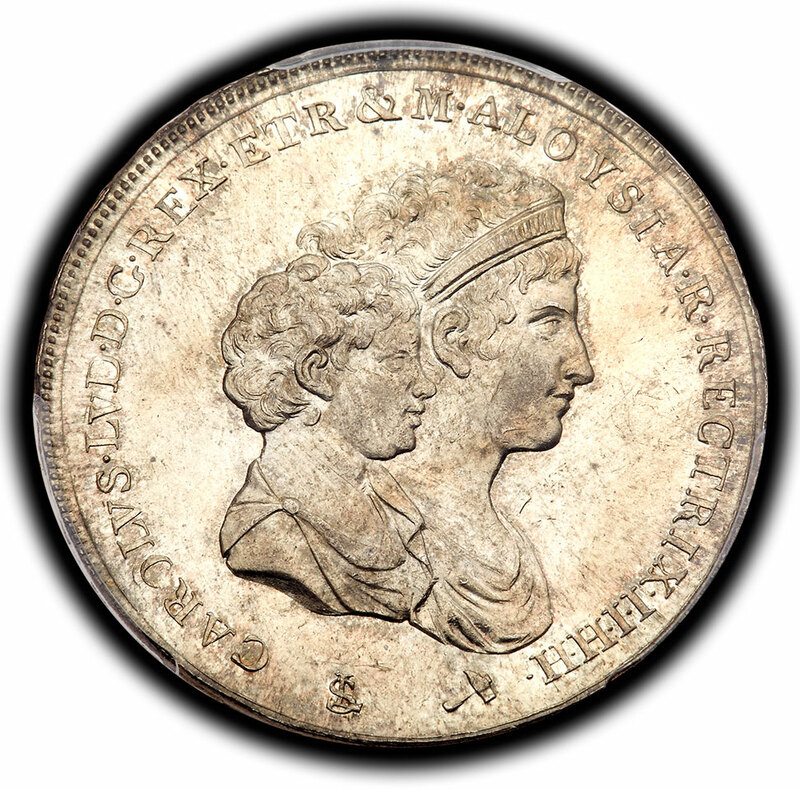 Obverse depicts mother and son facing right. 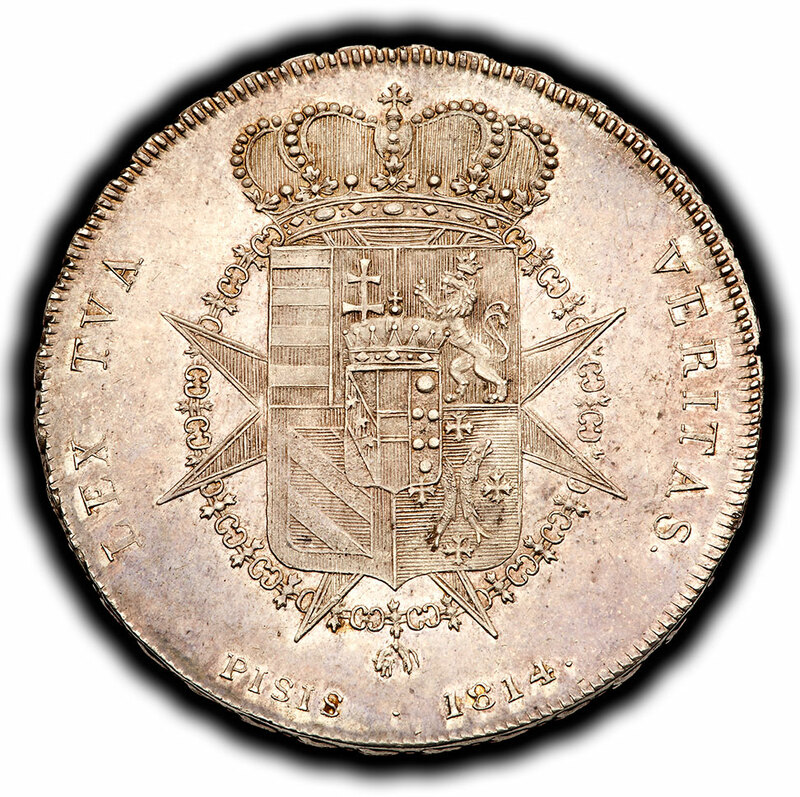 The reverse shows a crowned shield with spikes in order chain. 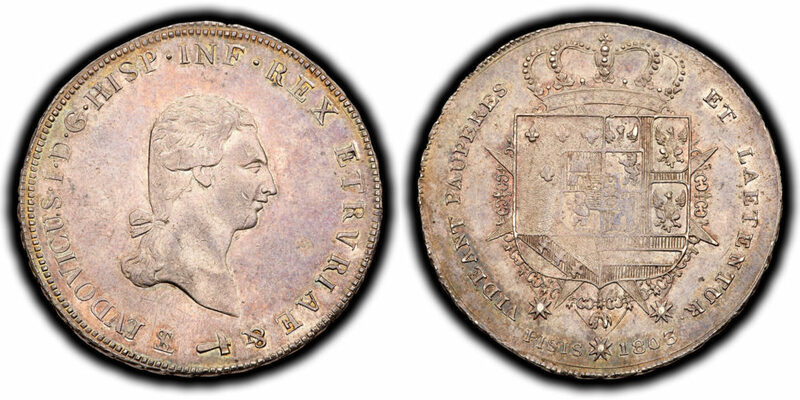 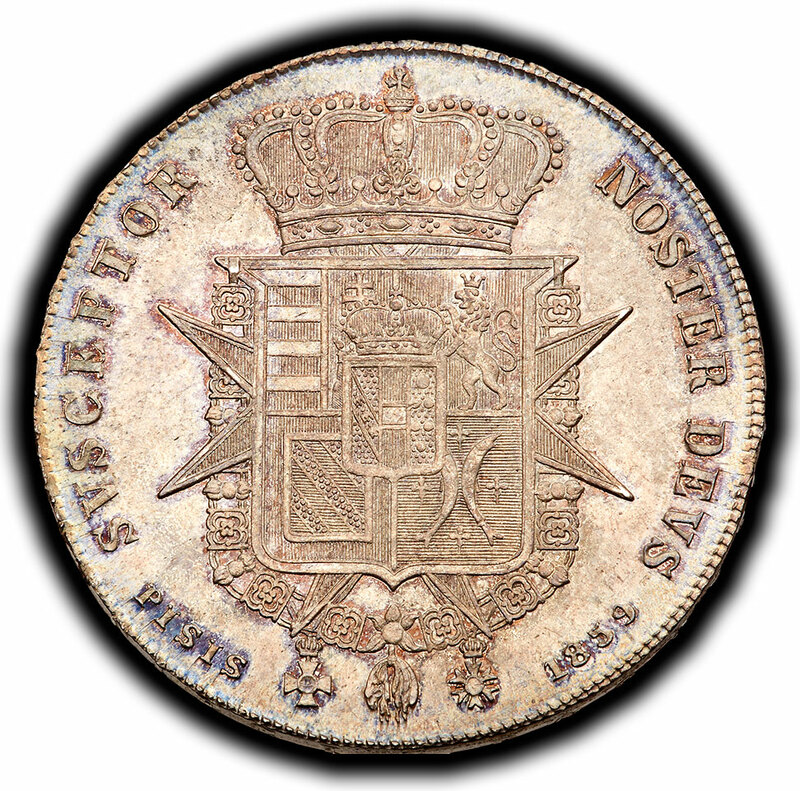 One of the finest examples extant of this popular issue, with deep toning and bold details. 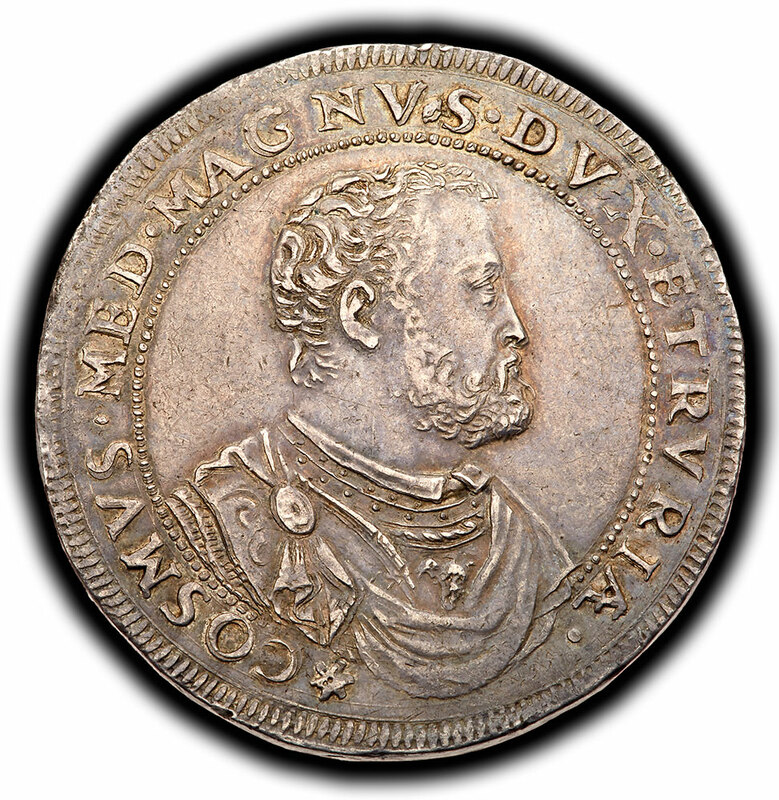 Charming, detailed jugate portraits, all details even and sharp, with lightly toned surfaces. 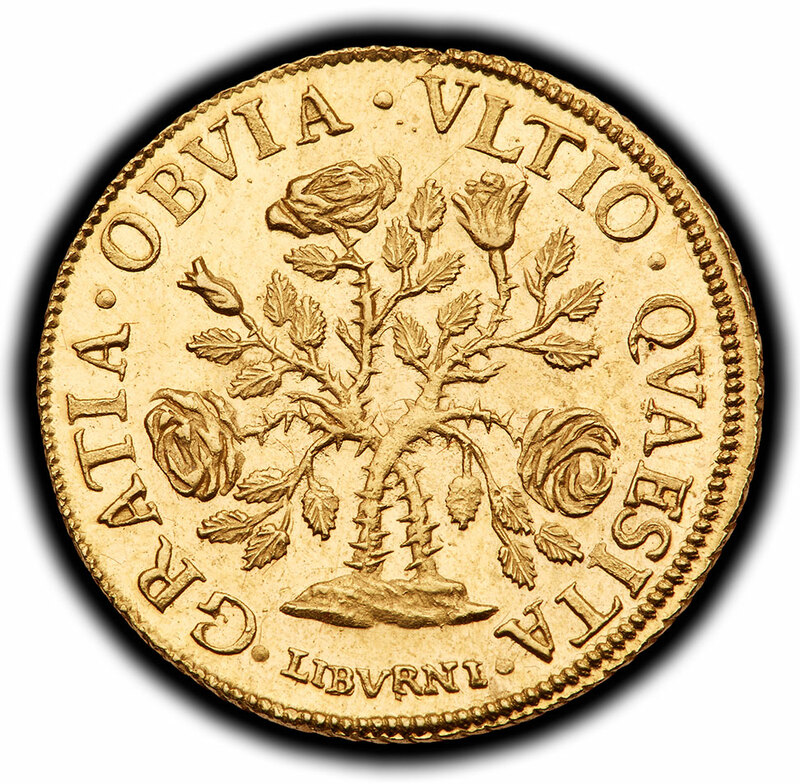 Obverse depicts a lily. 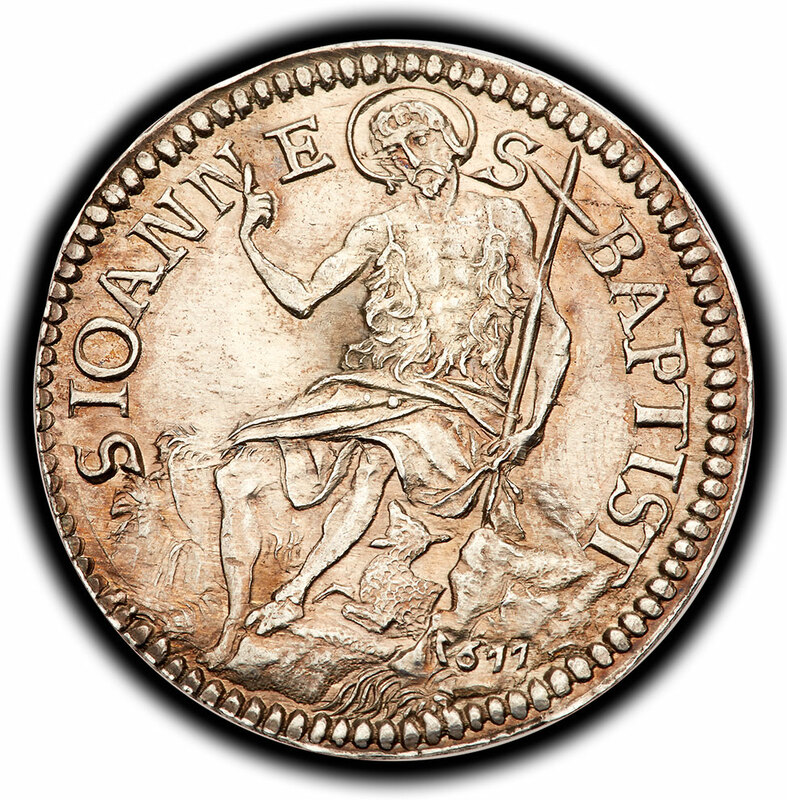 The reverse shows St. John seated facing right. 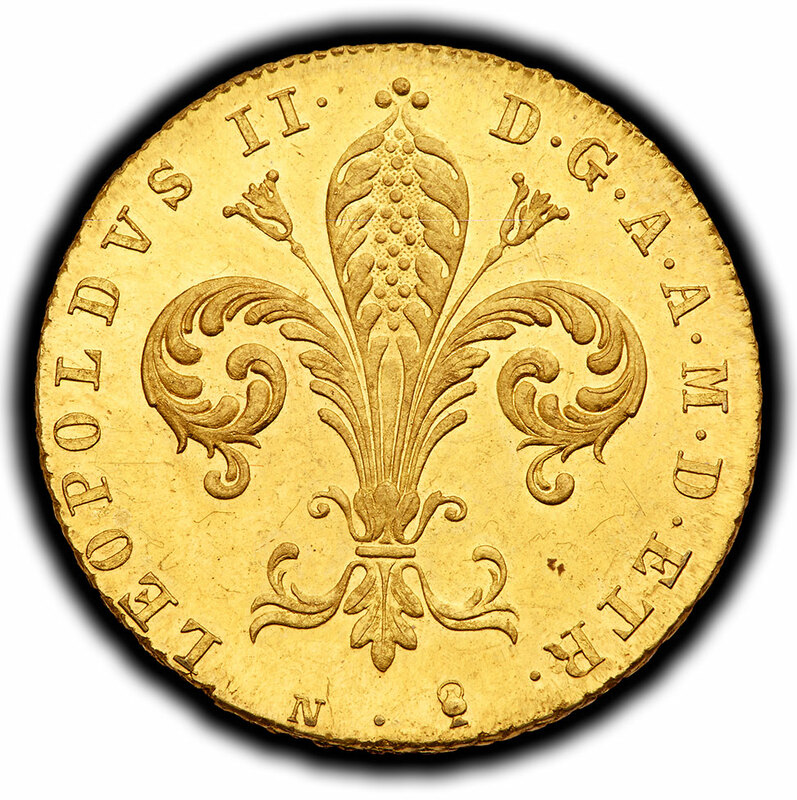 Scarce; especially choice with lovely gold surfaces and a boldly detailed lily of Florence. 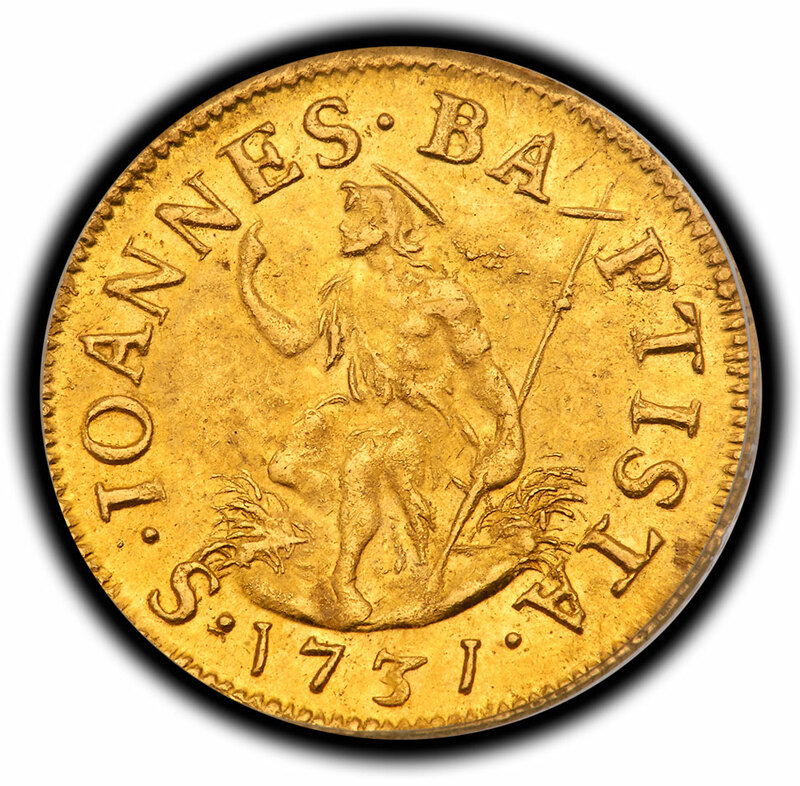 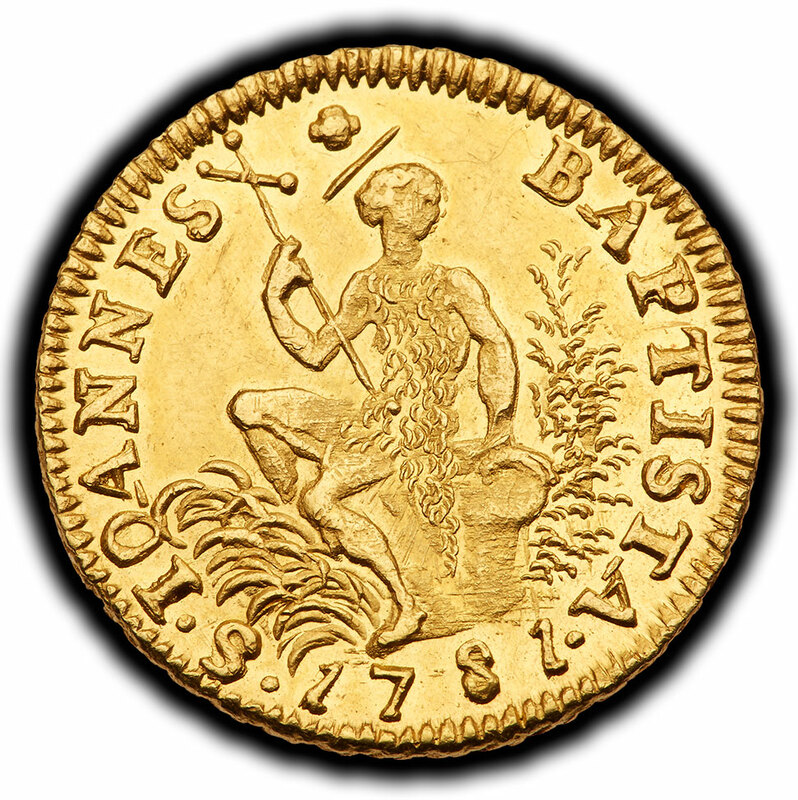 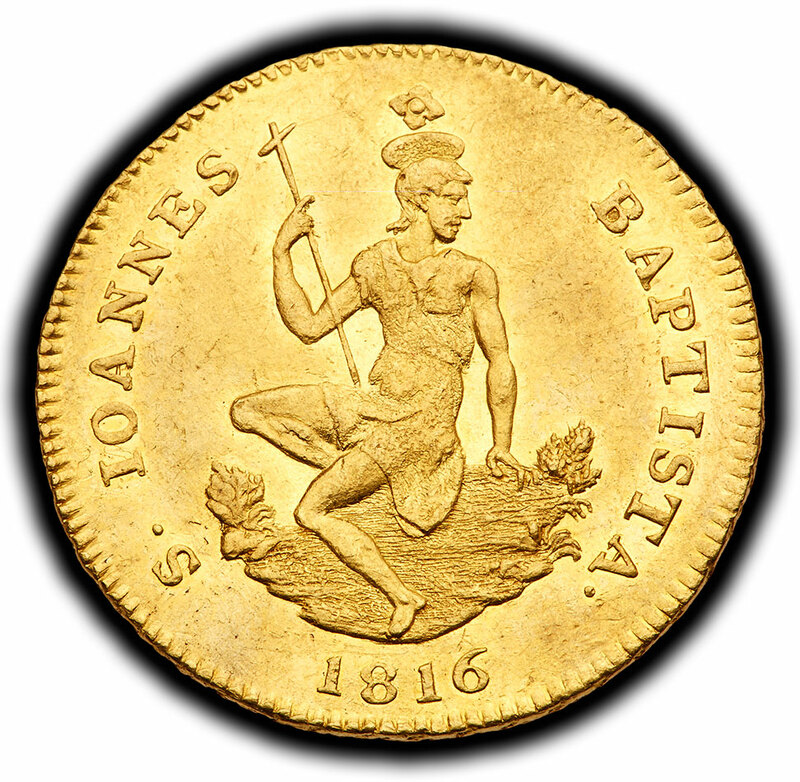 Very choice with excellent, sharp detail and lovely gold toning: a wonderful coin showing John the Baptist and the lily of Florence. 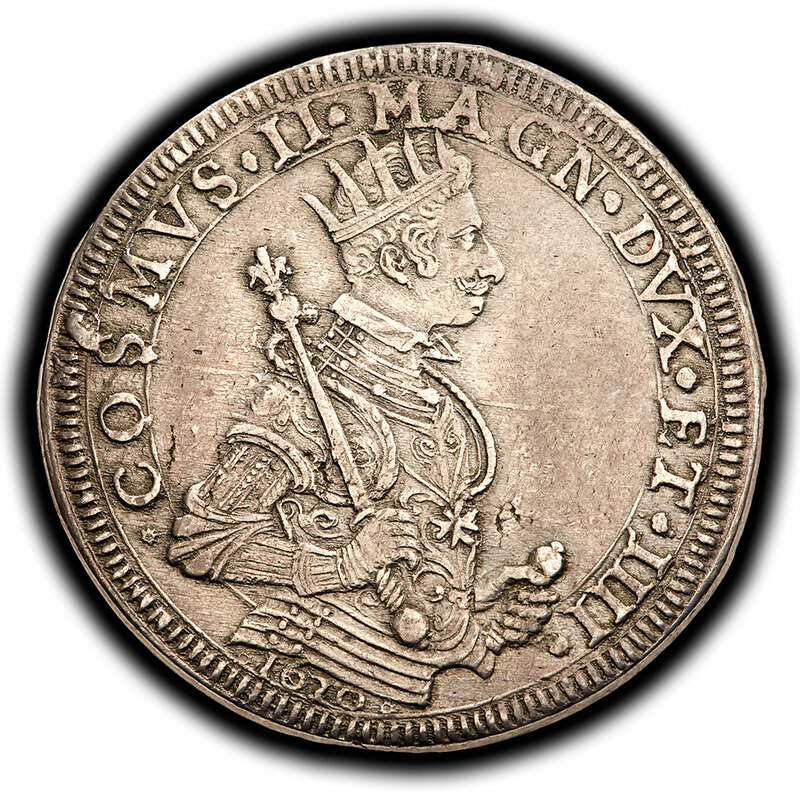 Known in Italy as Leopoldo Giovanni Giuseppe Francesco Ferdinando Carlo, he was devoted to developing his adopted country outside of the control of his native Austria. 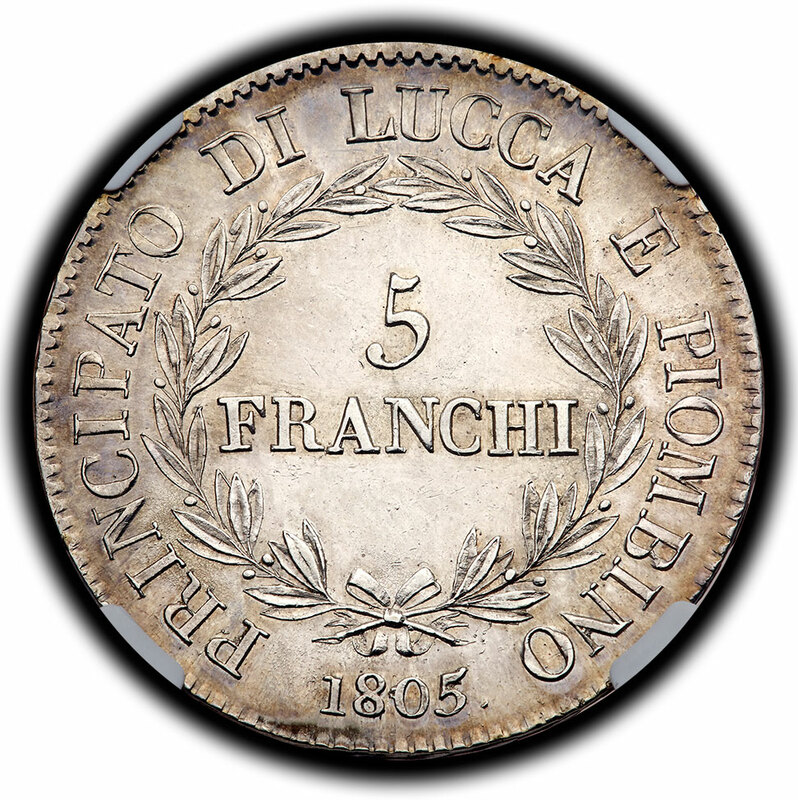 When civil unrest spread through all of Italy in the 1840s, Leopold’s ambitions faltered but he is remembered for his many civic improvements. 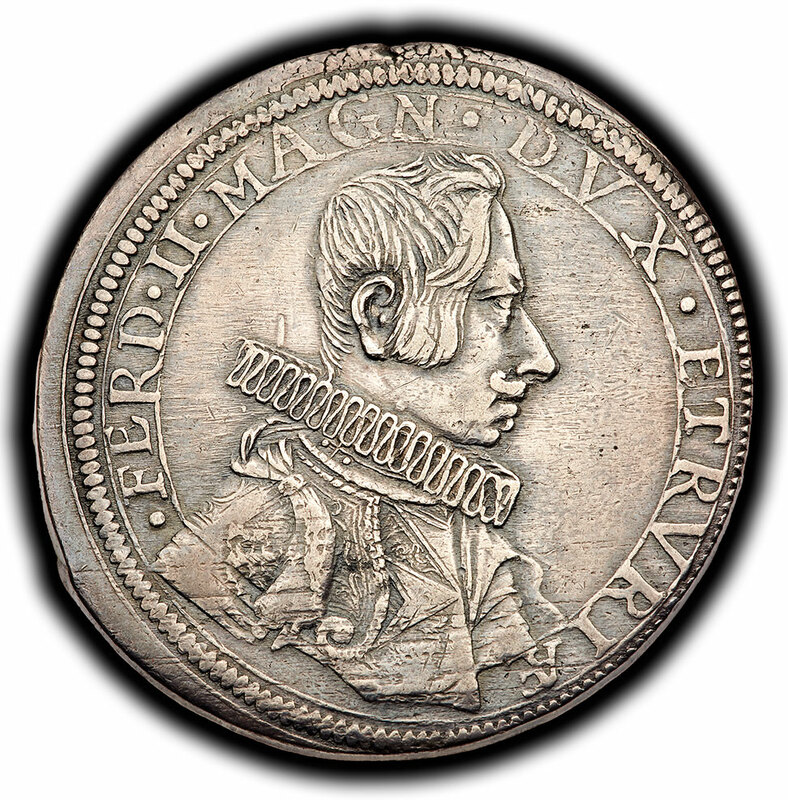 He died in Rome after abandoning his control of Florence and living in Austria. 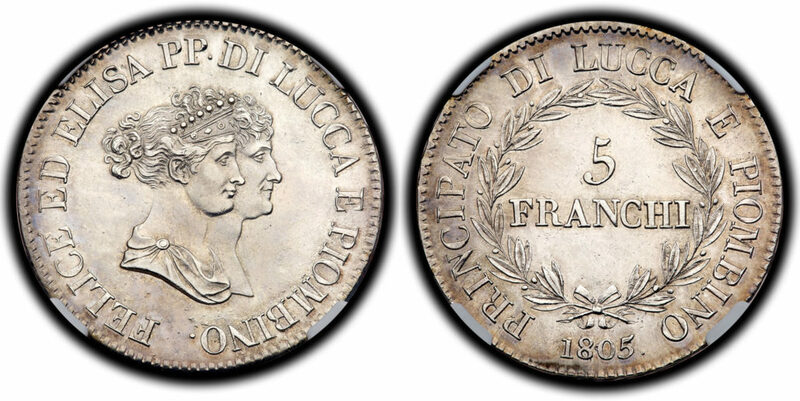 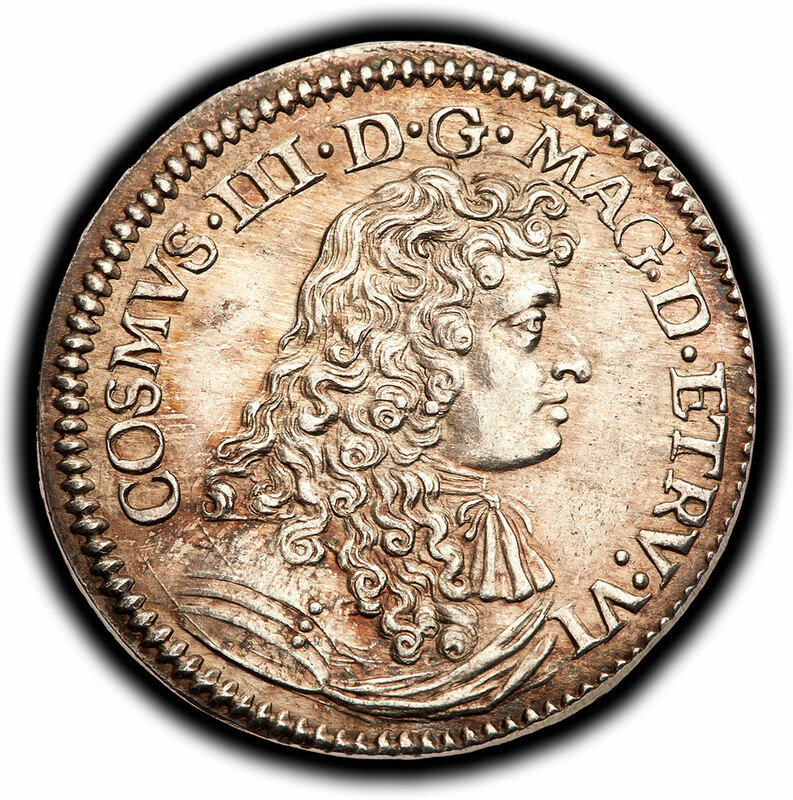 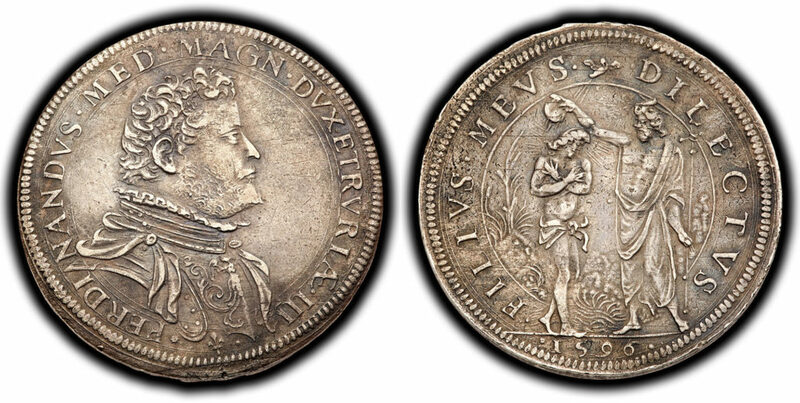 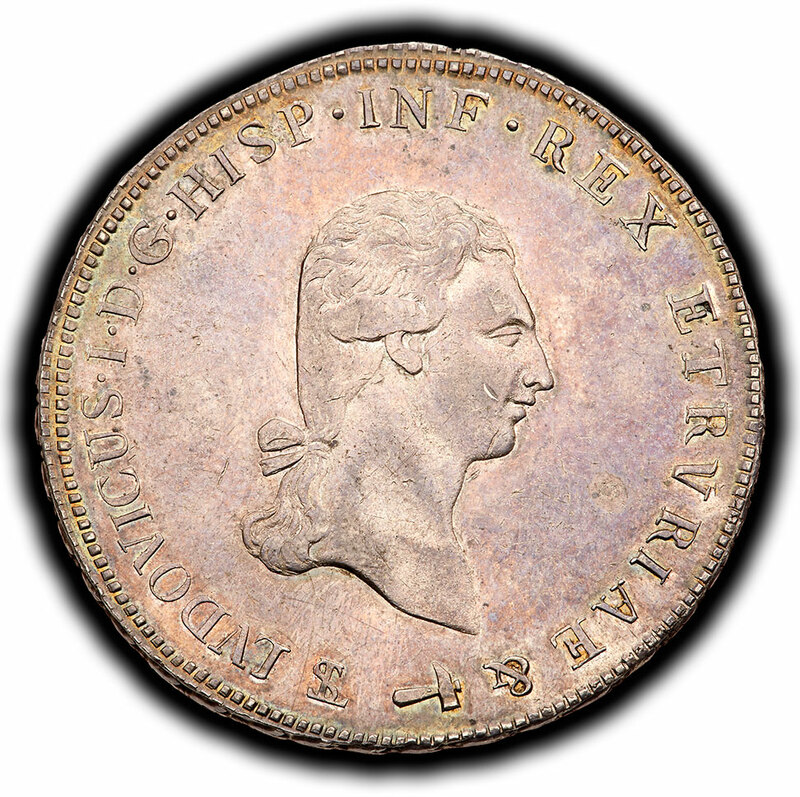 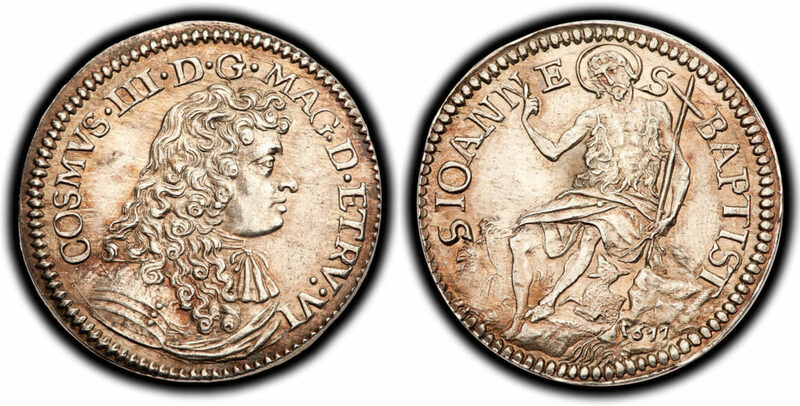 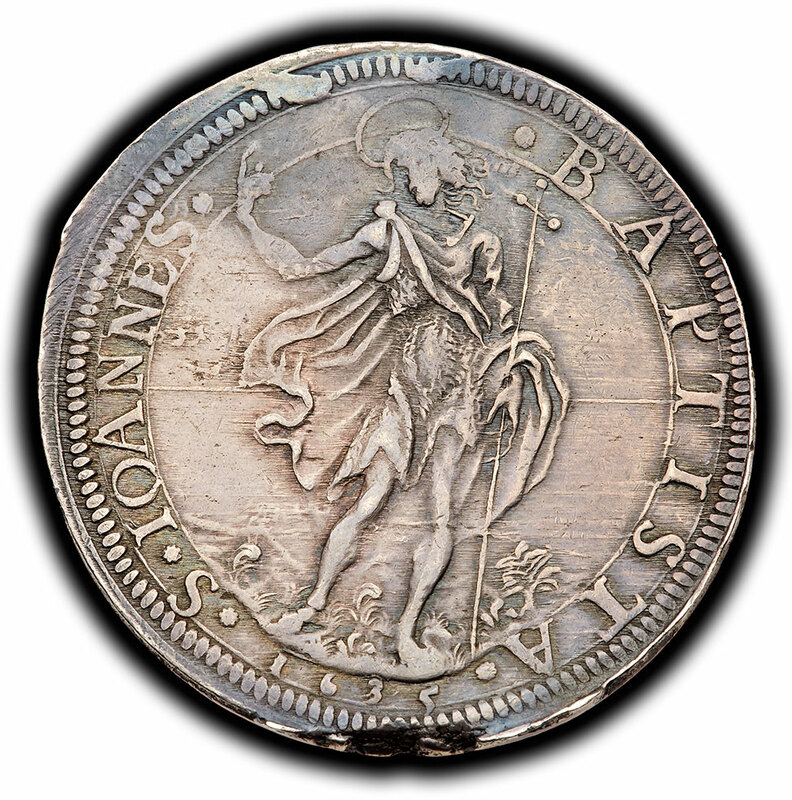 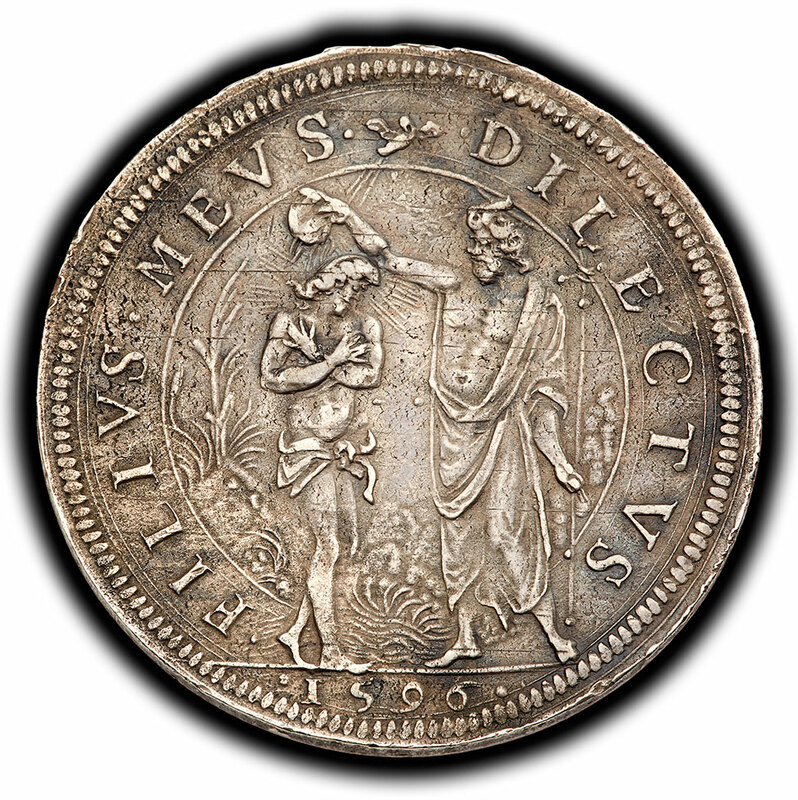 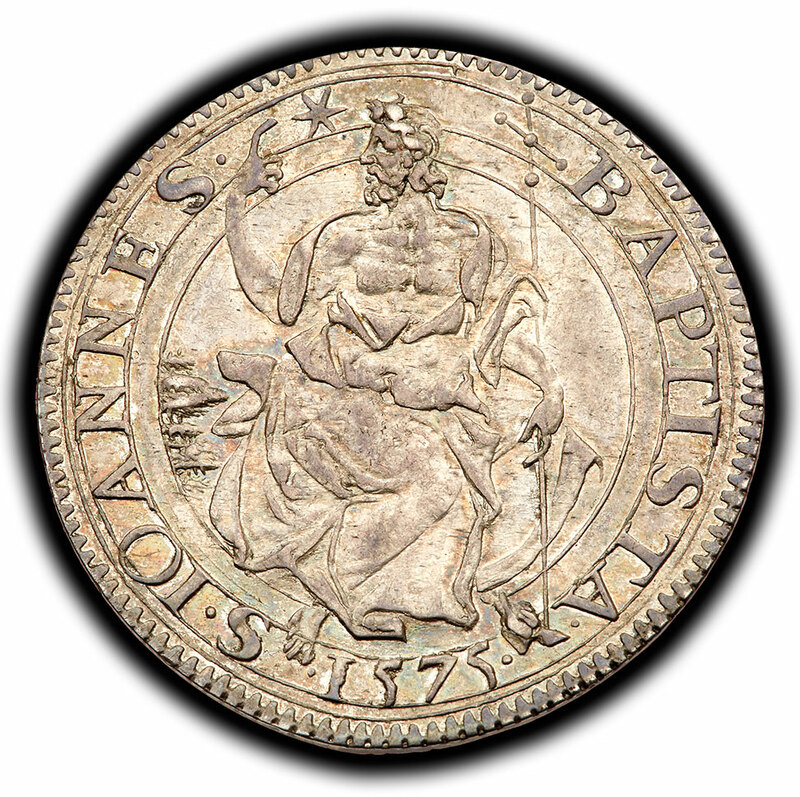 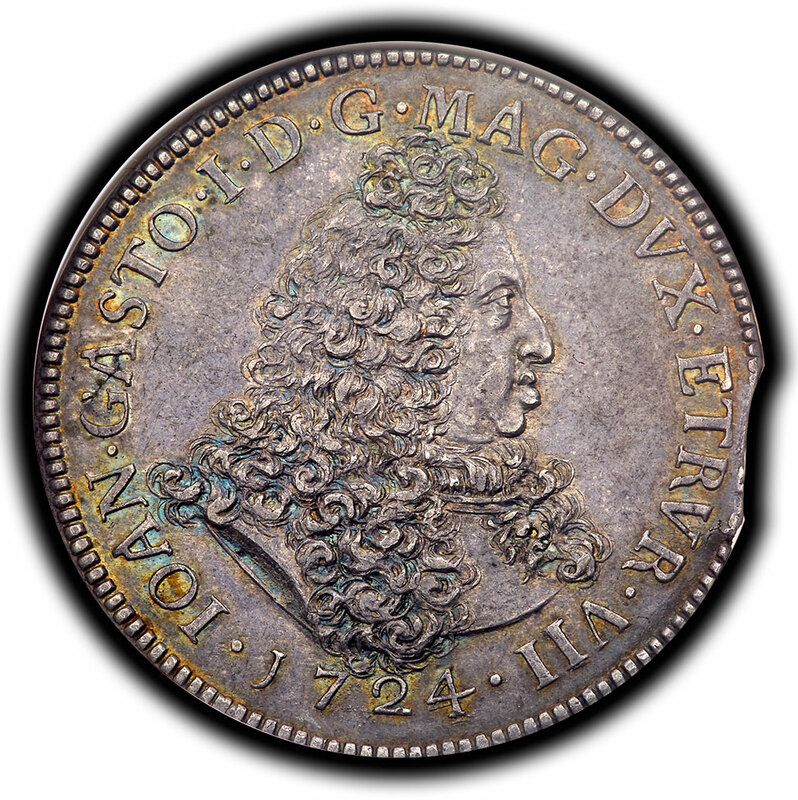 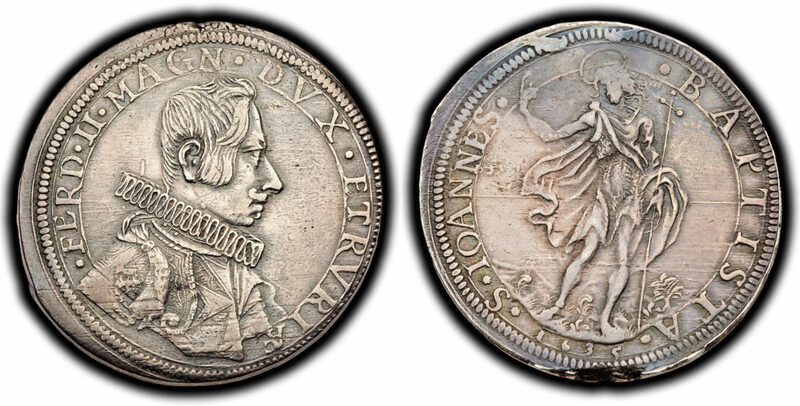 This coin was struck during his glorious period.